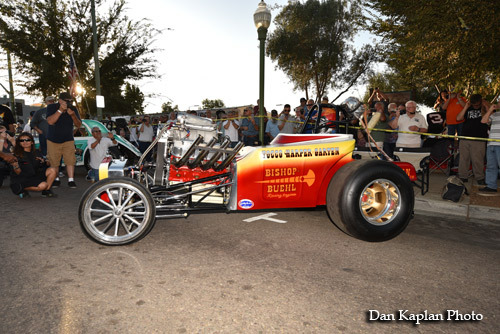 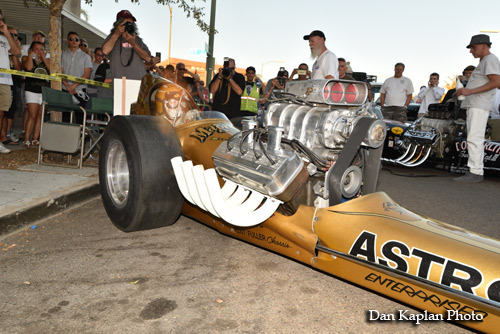 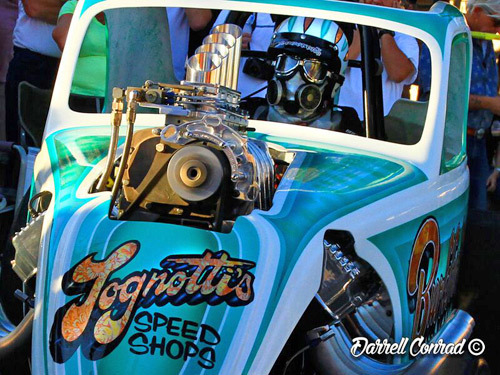 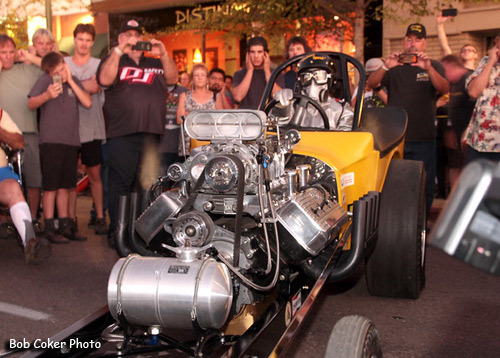 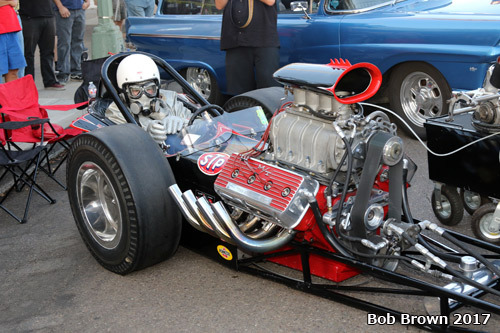 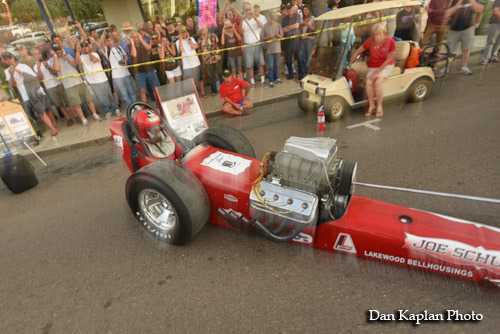 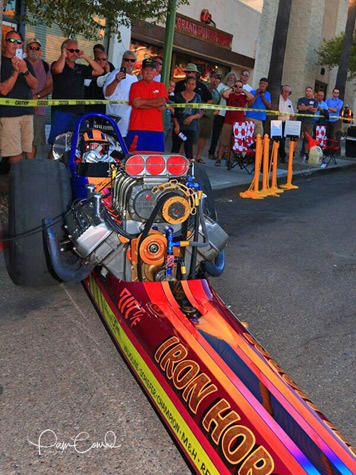 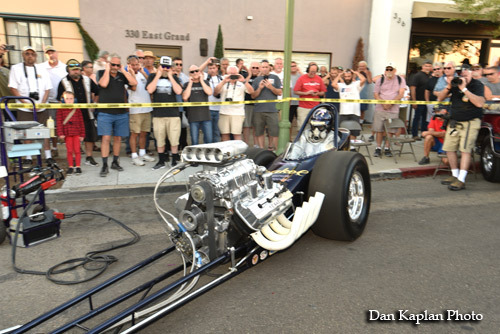 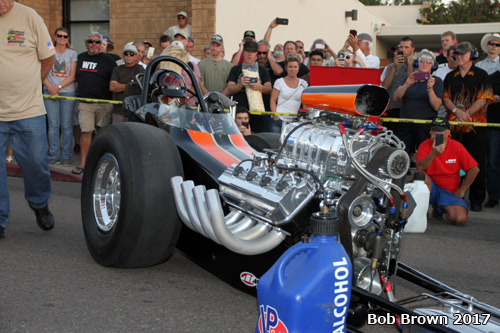 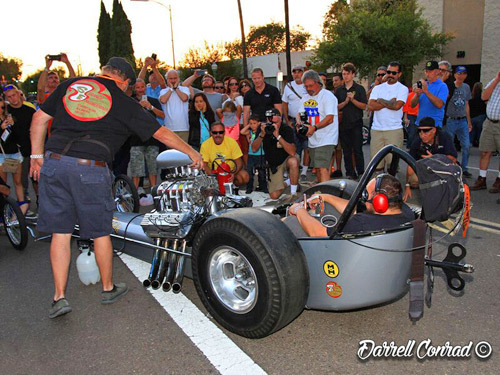 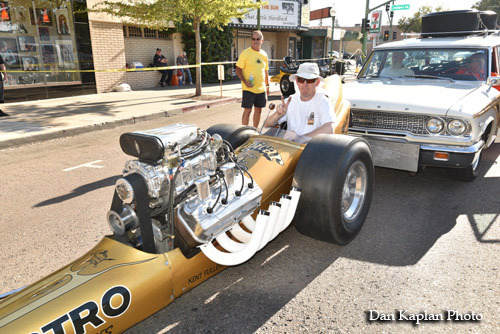 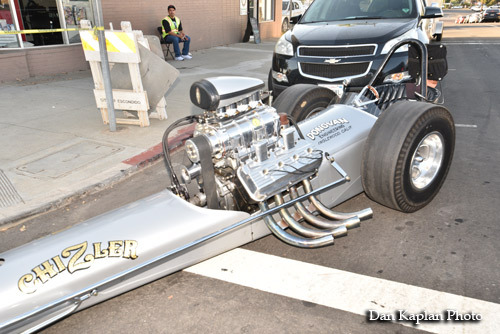 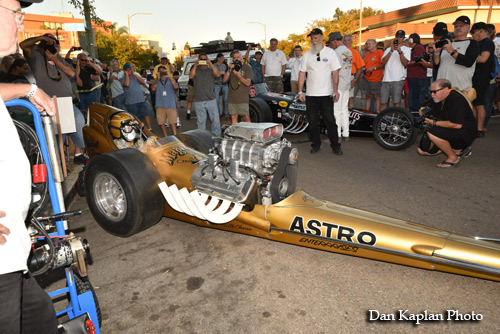 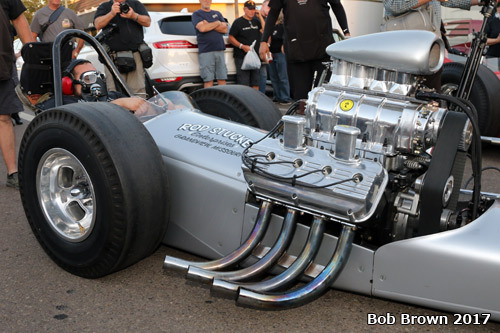 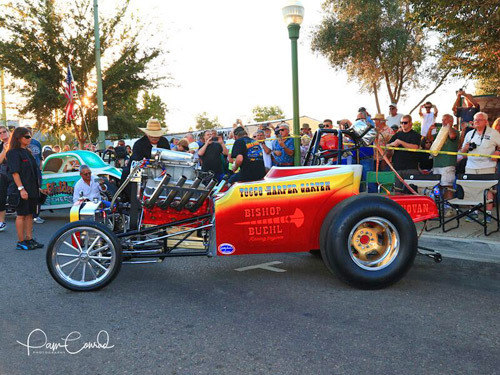 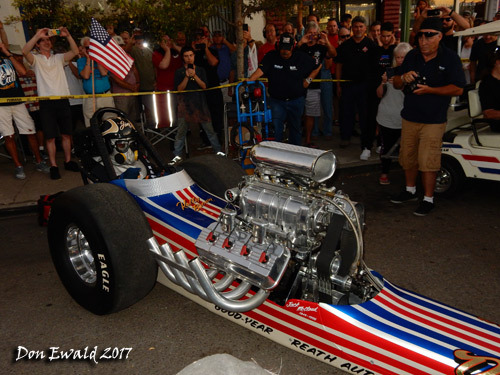 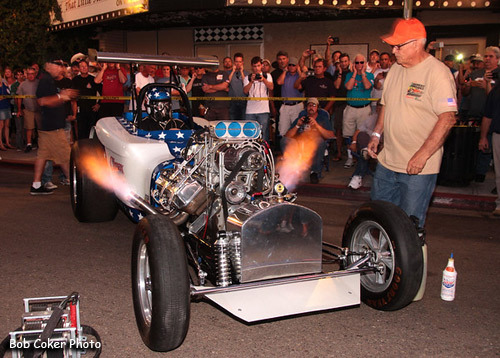 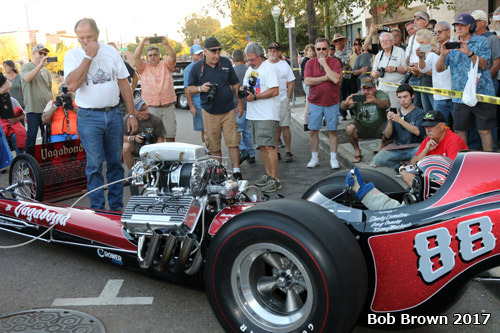 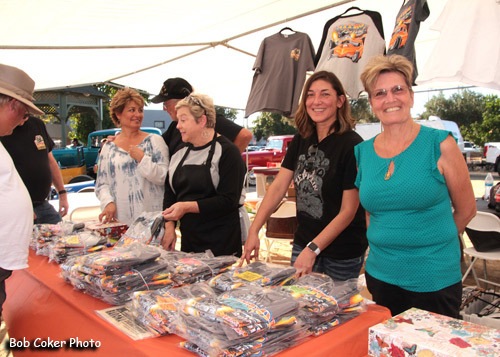 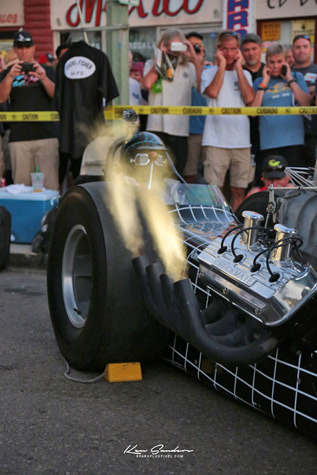 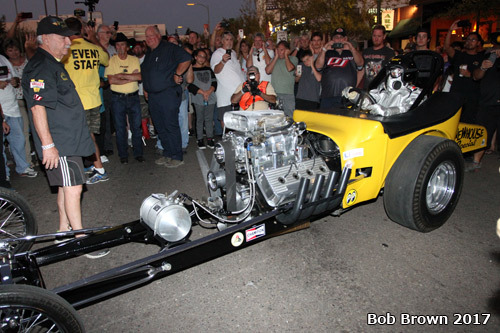 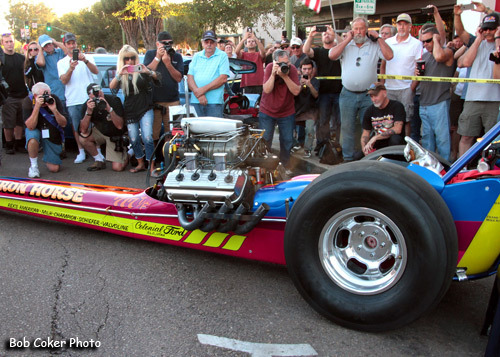 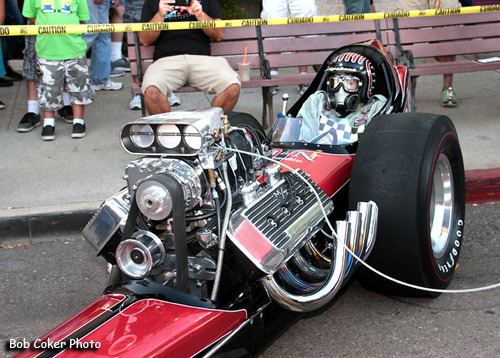 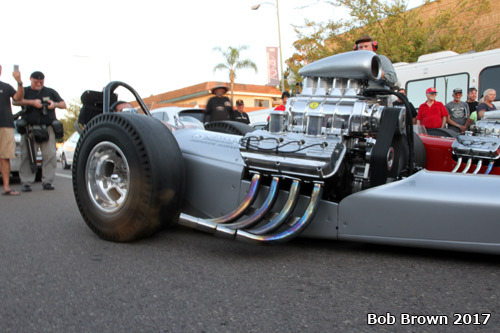 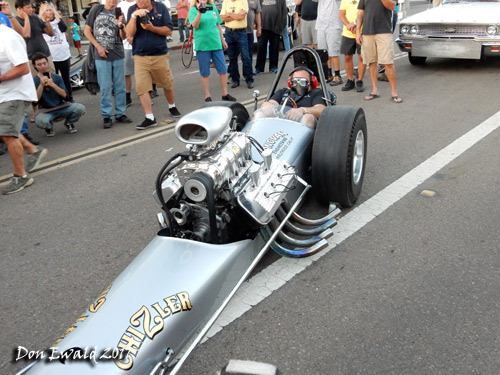 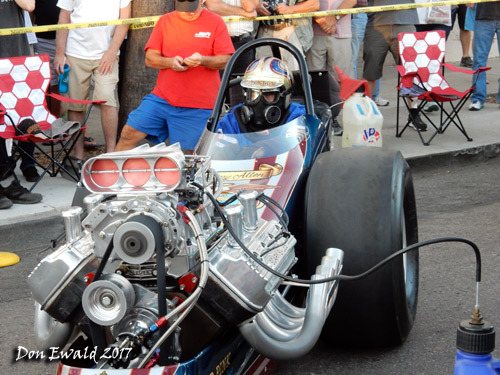 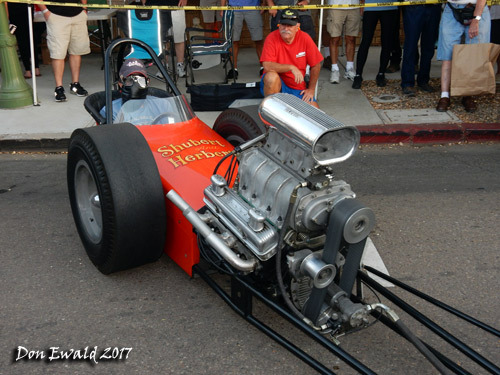 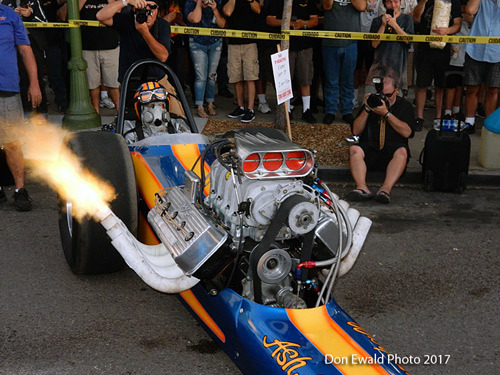 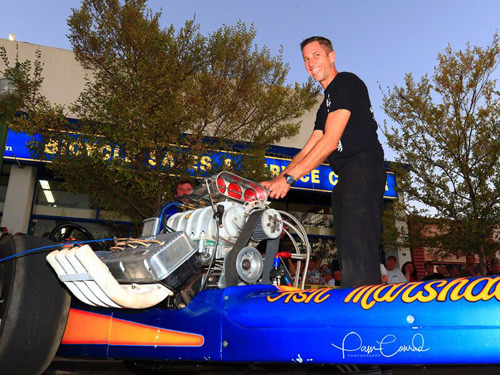 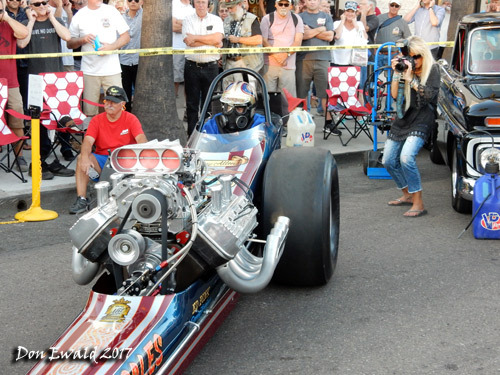 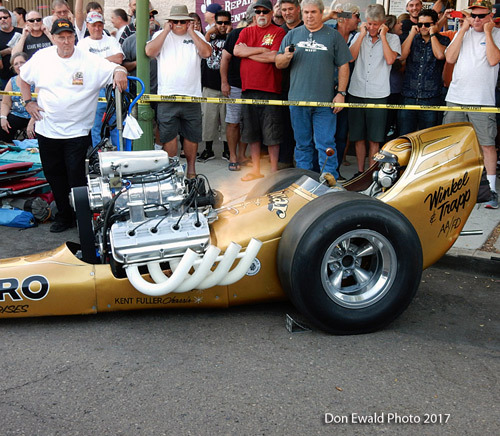 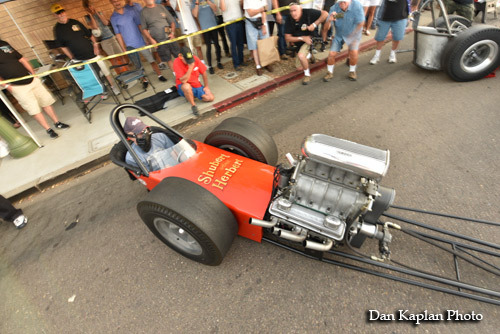 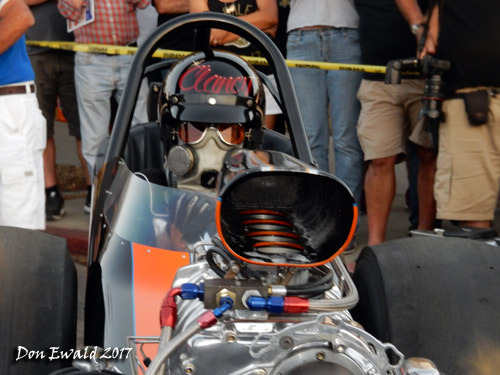 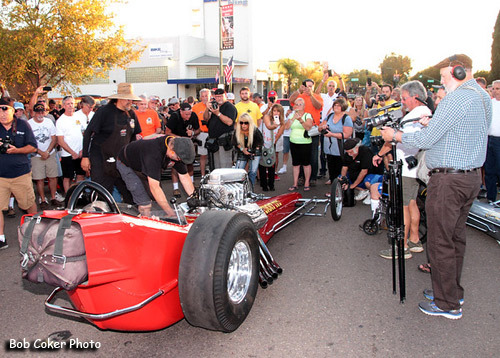 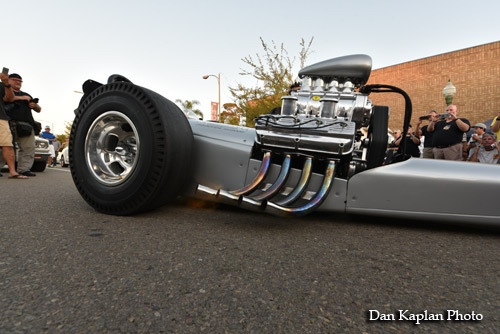 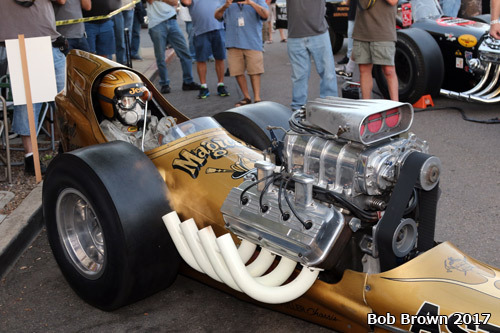 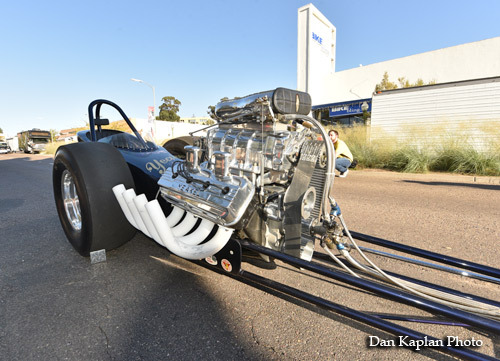 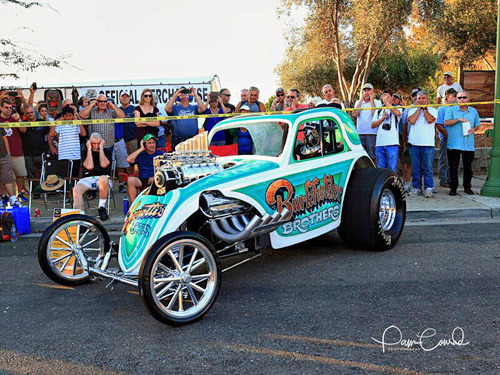 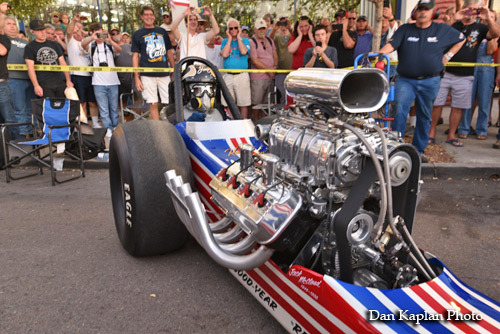 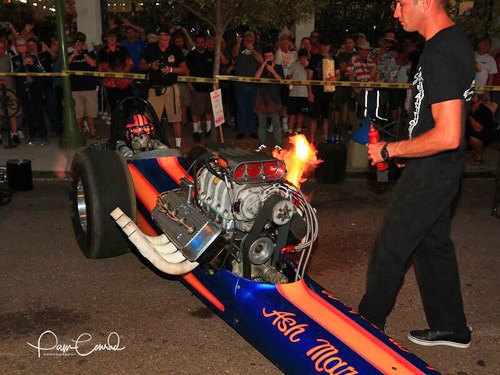 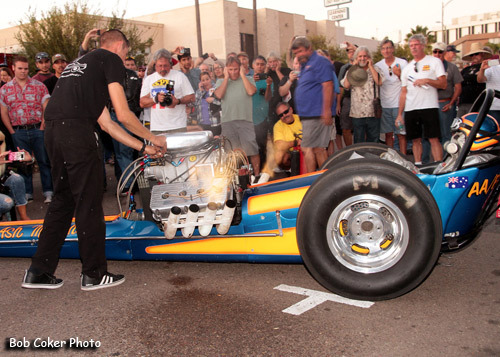 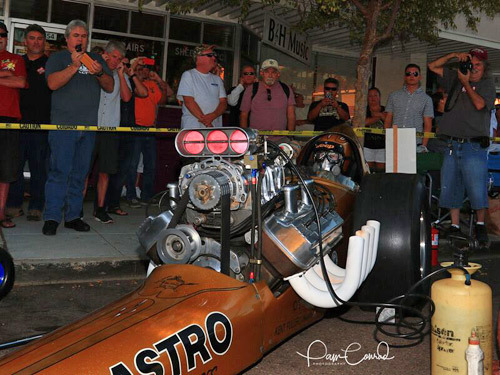 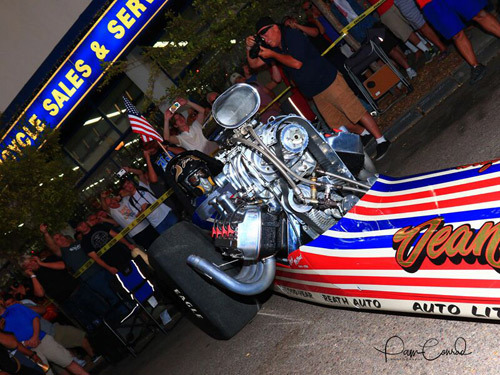 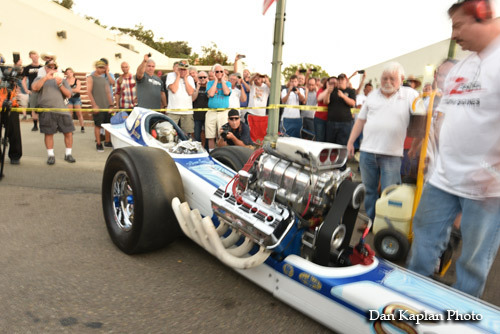 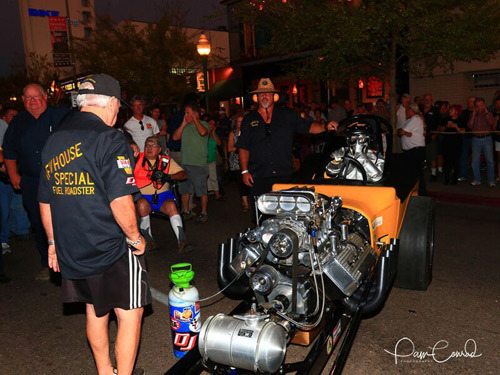 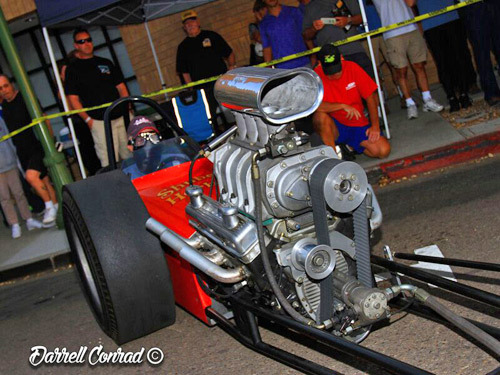 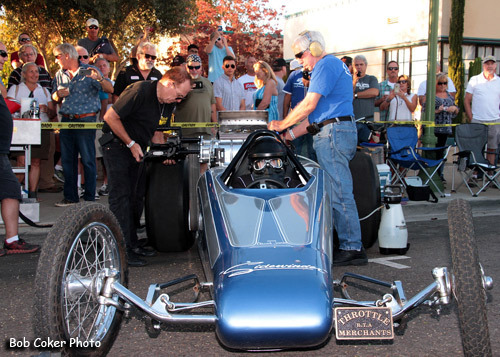 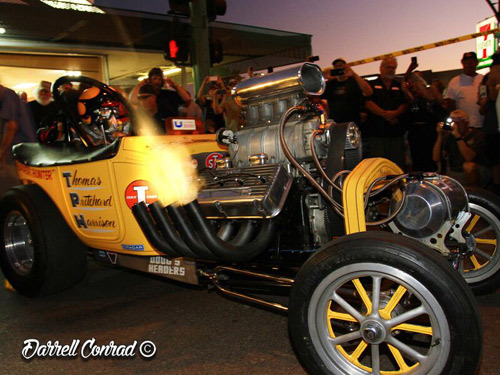 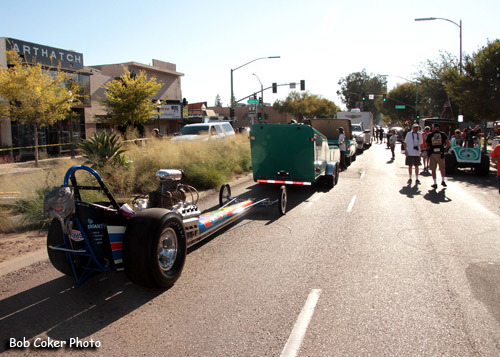 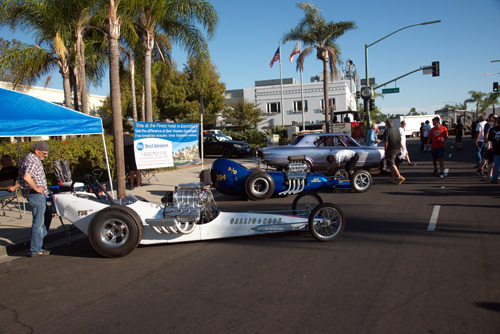 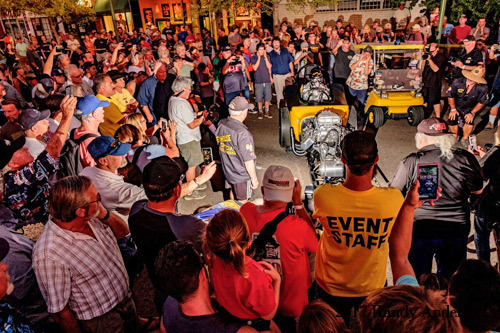 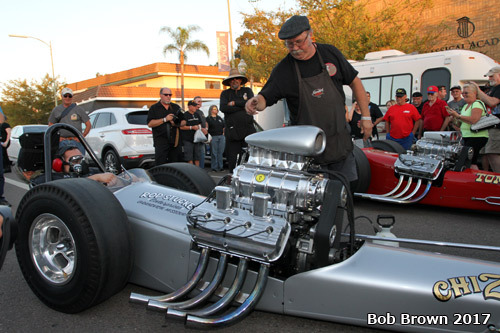 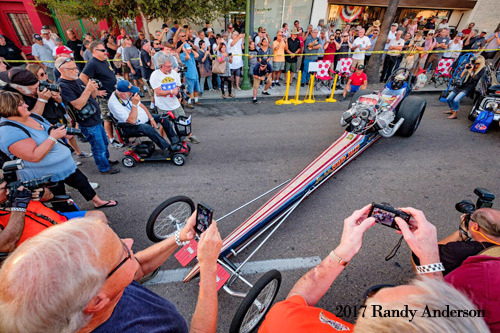 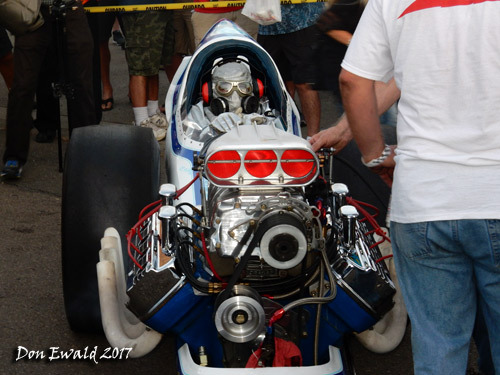 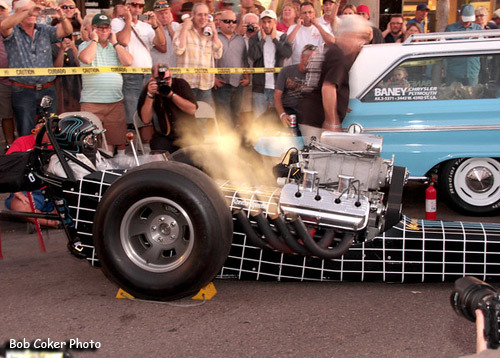 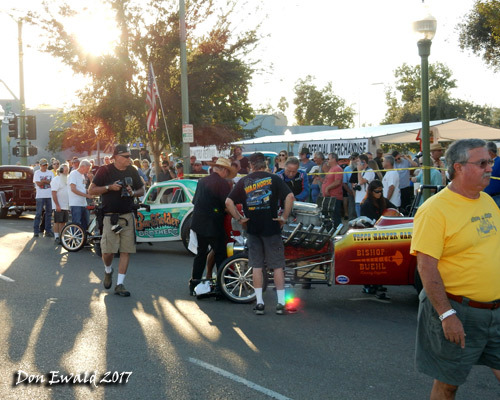 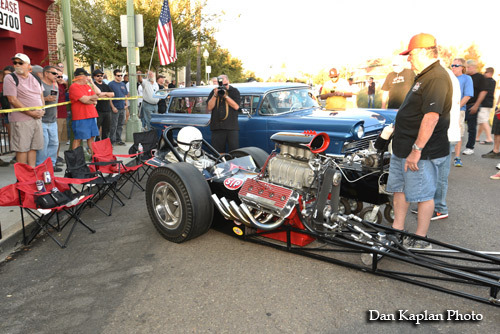 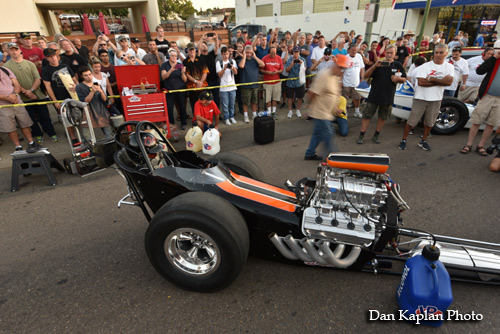 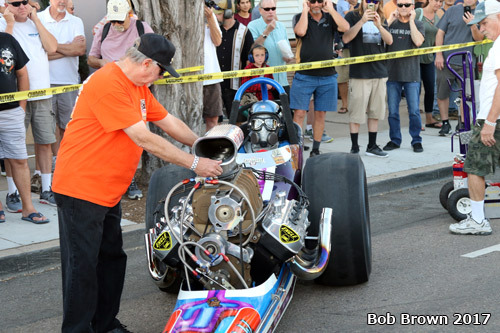 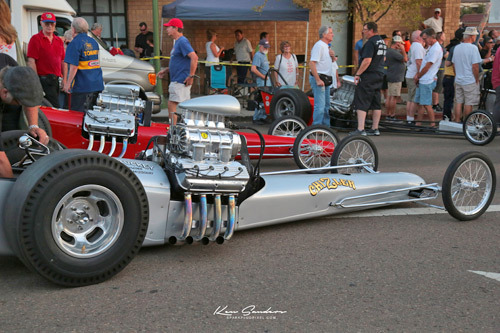 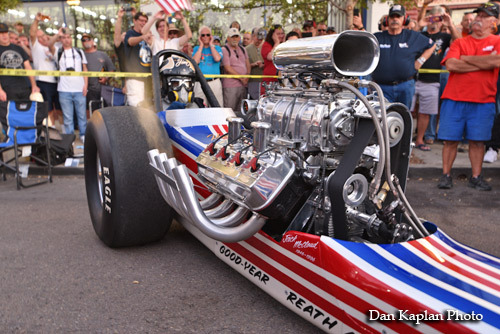 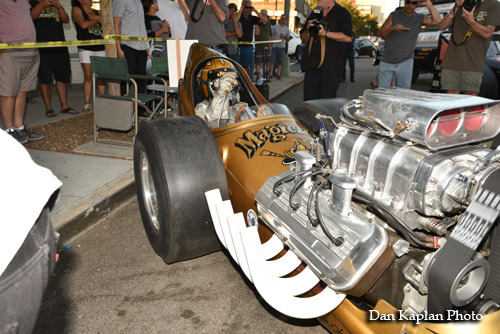 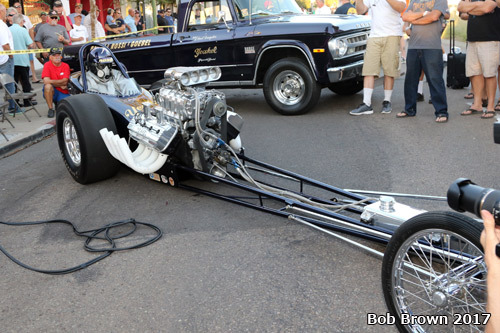 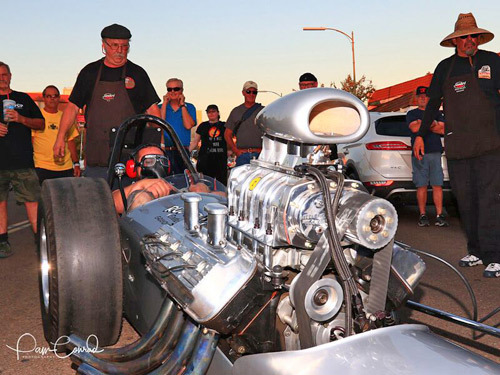 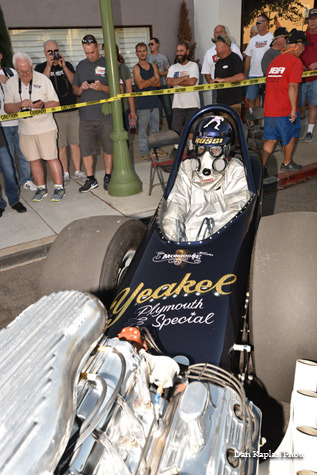 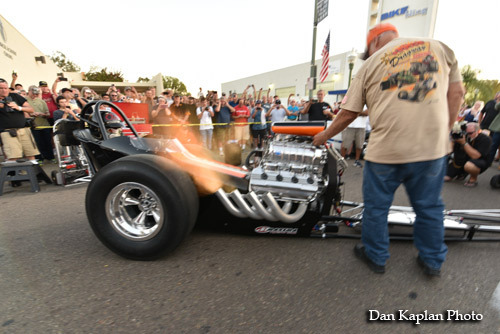 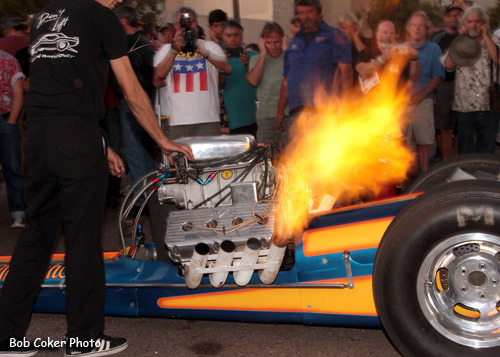 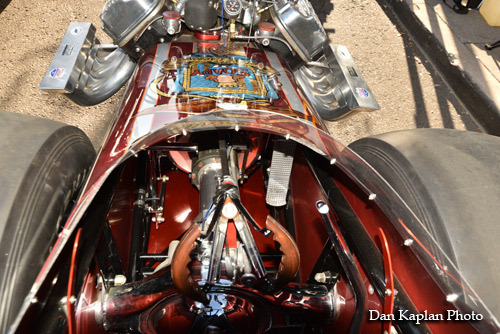 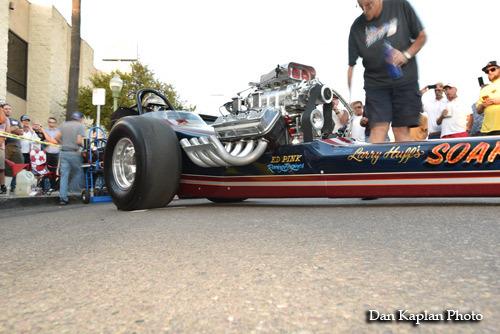 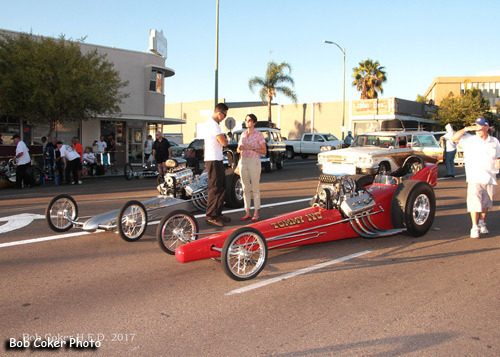 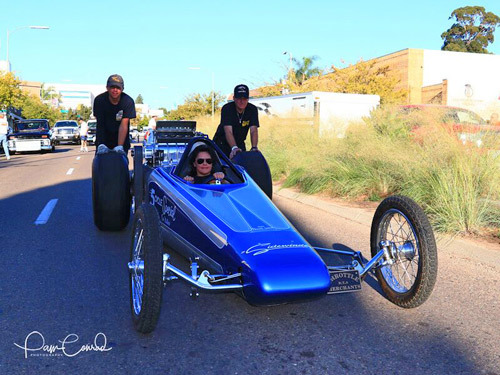 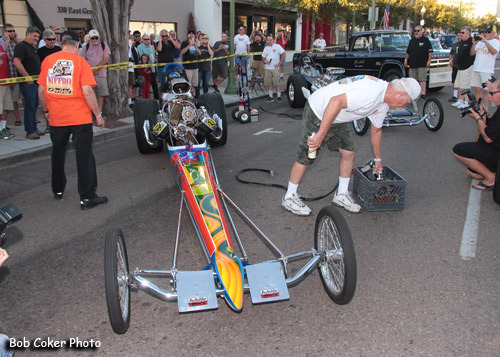 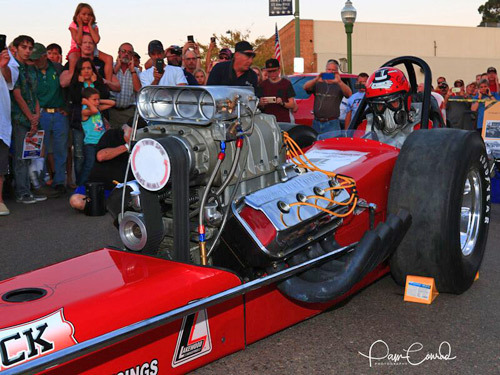 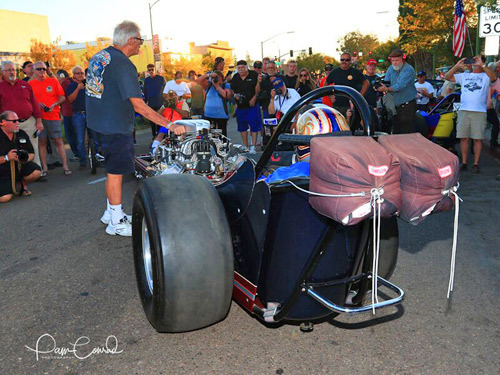 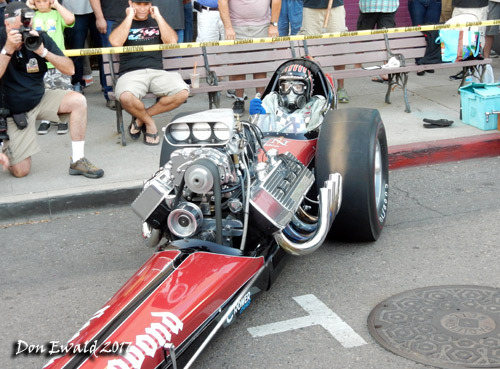 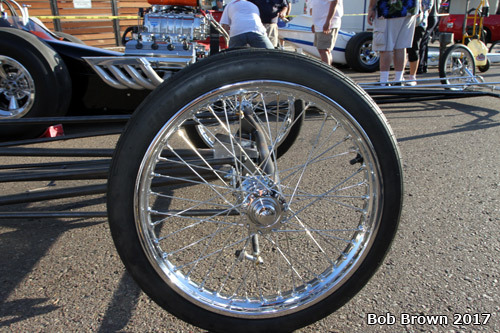 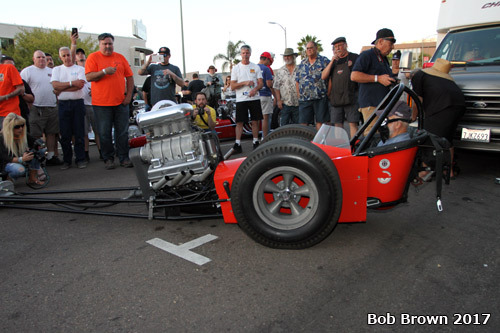 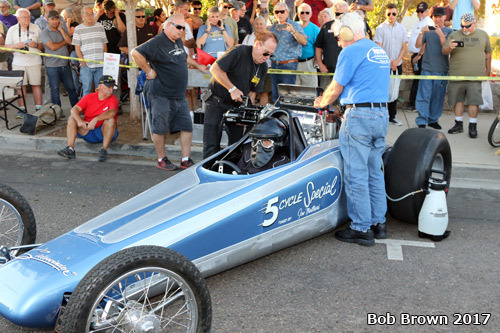 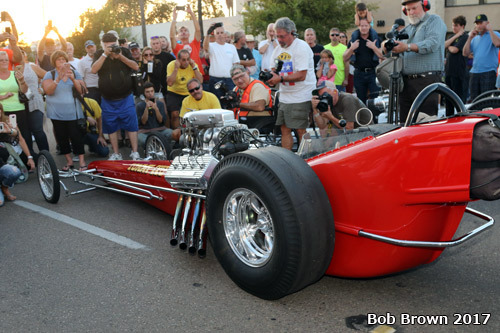 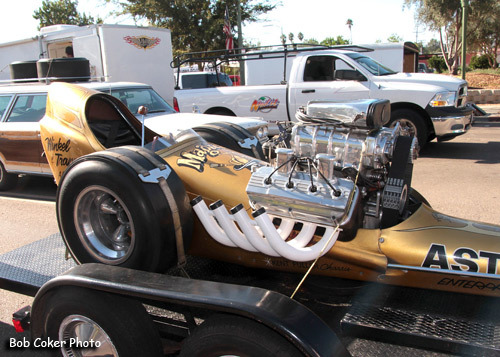 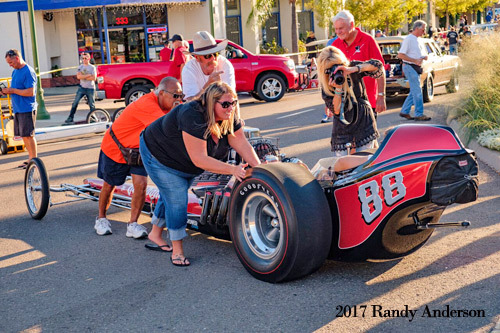 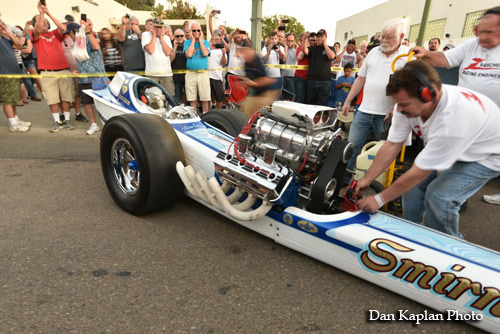 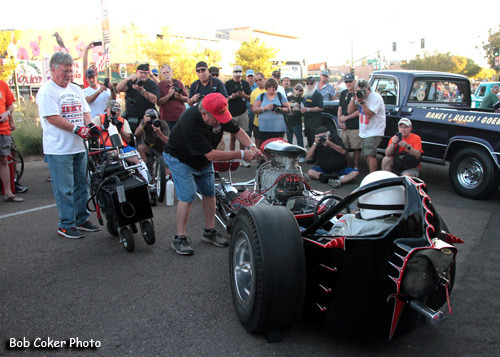 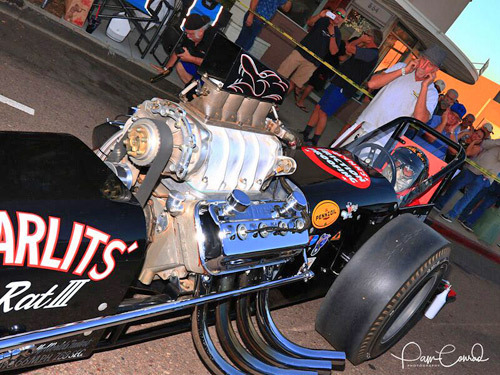 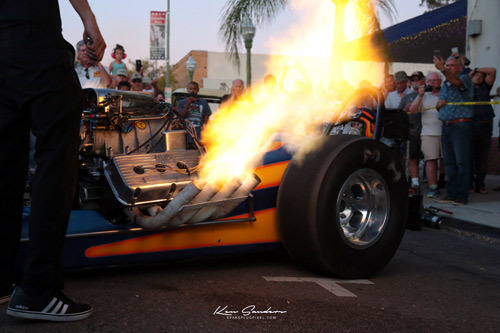 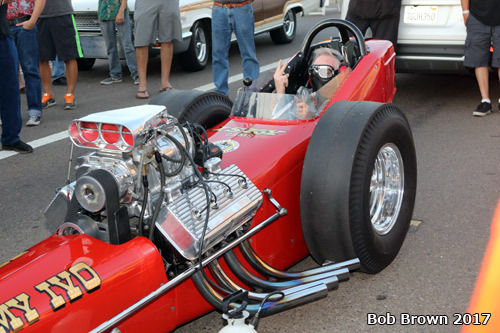 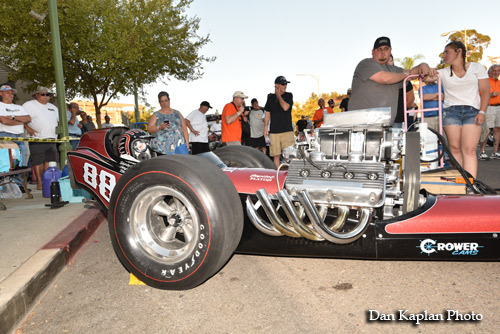 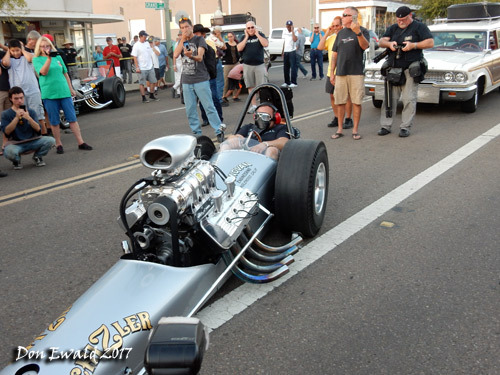 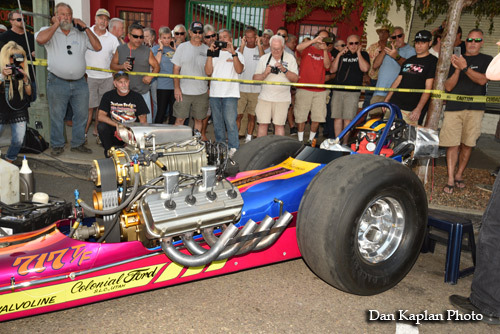 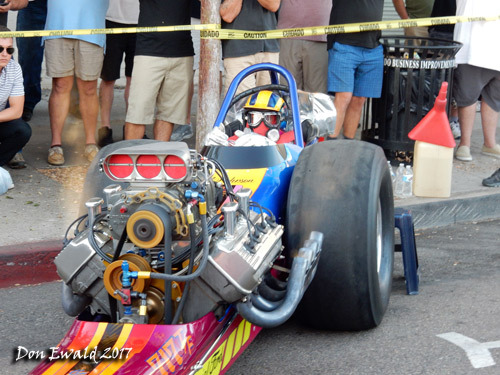 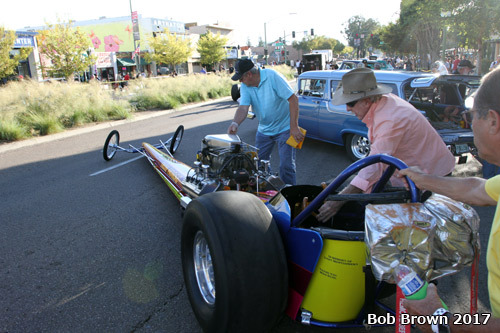 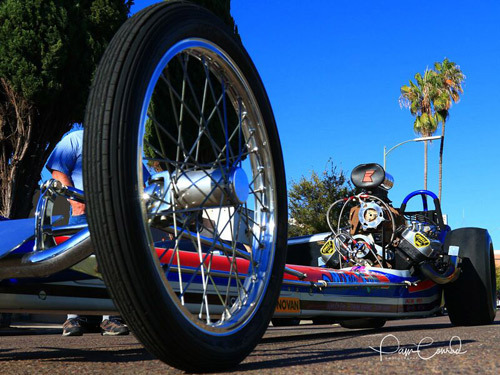 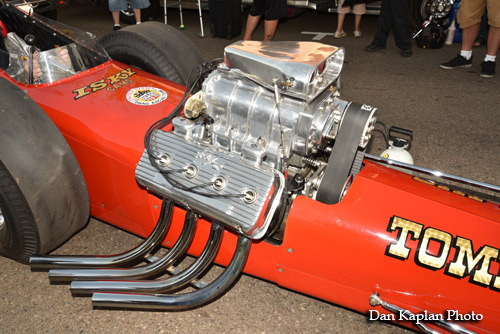 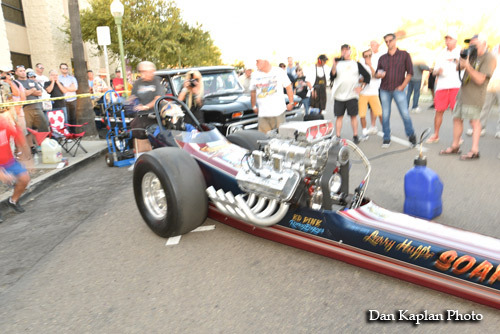 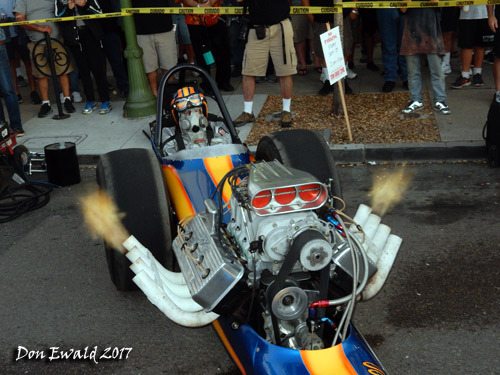 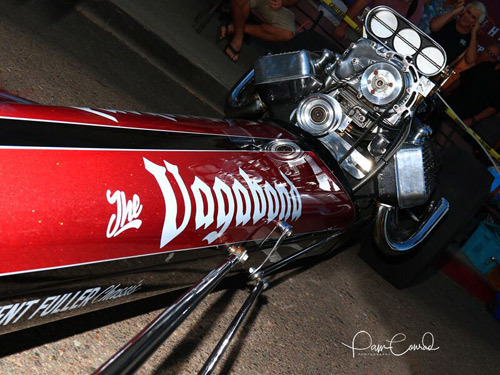 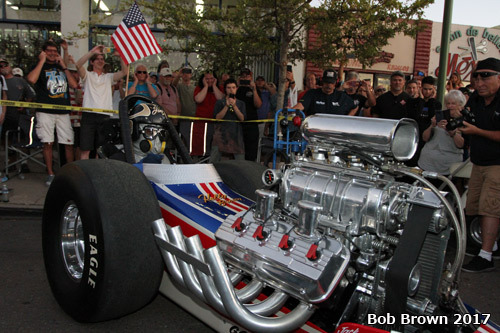 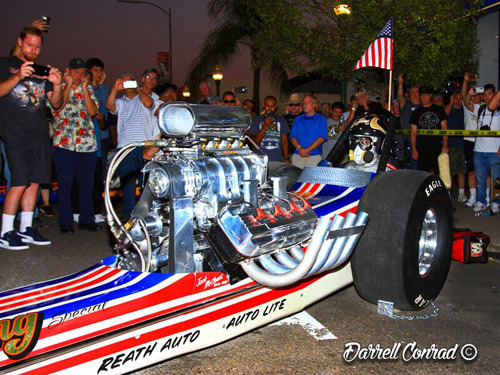 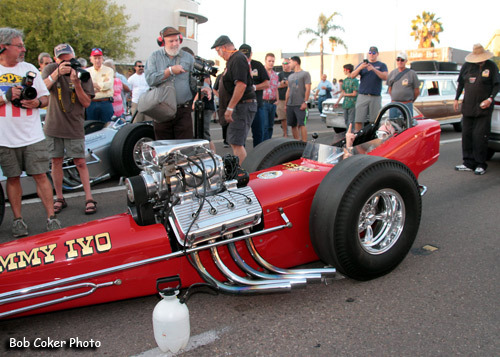 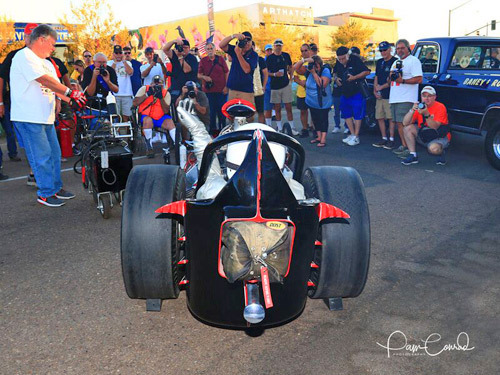 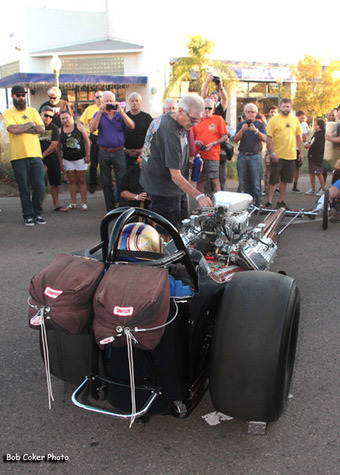 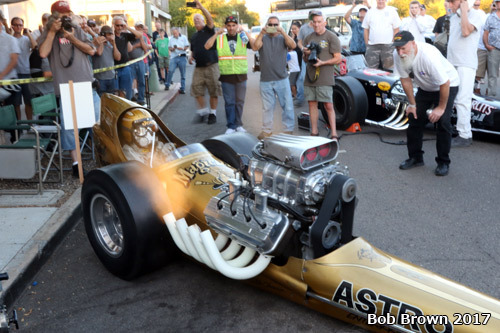 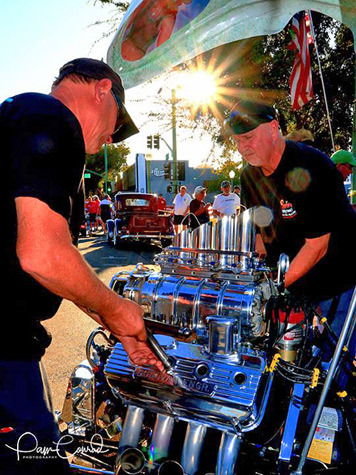 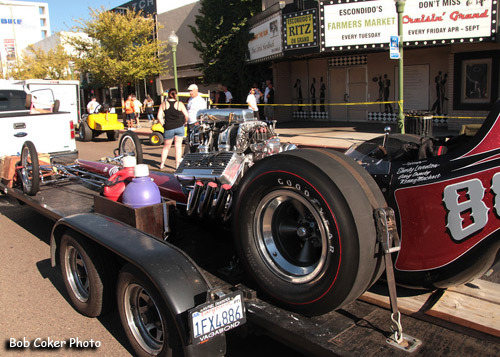 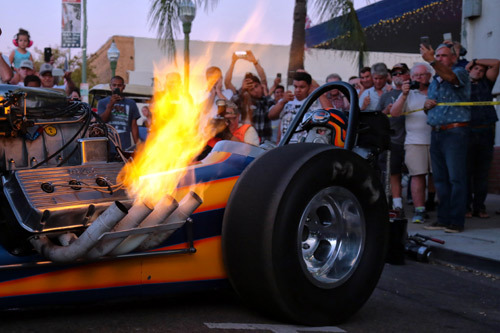 A fitting finale to the Cruisin Grand summer-long Friday night hotrod series in Escondidos historic downtown, Nitro Night ended the season with a bang, or more like a roar. 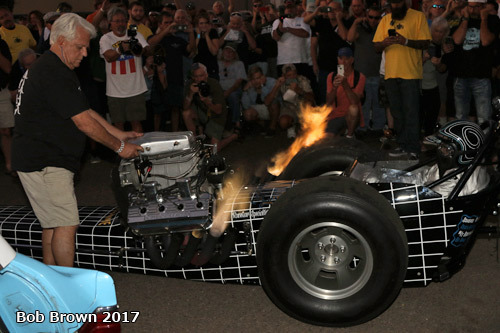 On September, 29th 22 historic nitro dragsters and fuel altereds from the Golden Years of nitro racing were displayed and in a dramatic after dark on-street fire-up illustrated what was so special about the late 60s Southern California drag racing scene, an amazing spectacle from long ago. 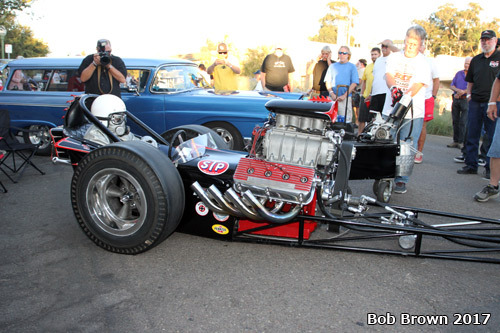 Southern California and San Diego were, in the late 60s, hotbeds of drag racing. 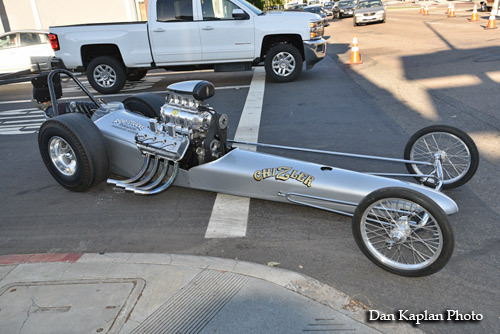 Young men were either into surfing or drag racing or maybe both. 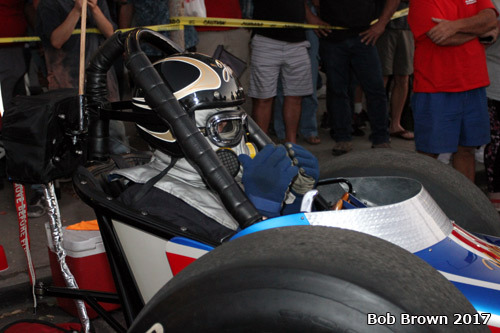 Numerous tracks operated on weekend days and nights allowing those who wanted to the opportunity to race on Friday night, Saturday night and Sunday at different area tracks. 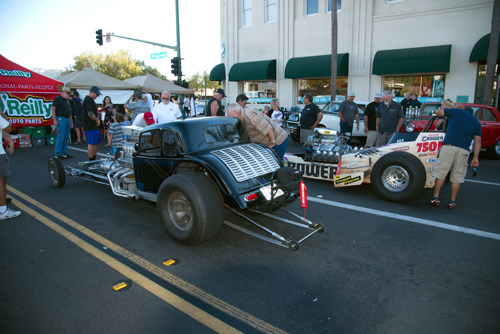 Fans had the choice of many tracks operating within easy driving distance. 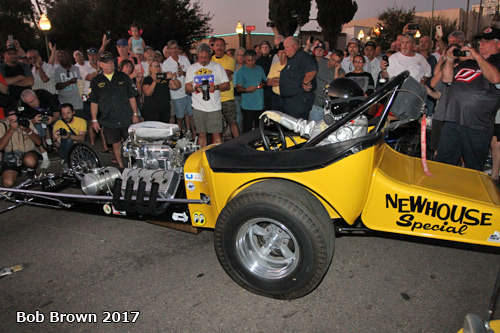 San Diego/Ramona, Carlsbad, Long Beach, San Gabriel, Fontana, Riverside, San Fernando, Ontario, Irwindale, Colton and Orange County all had tracks for some or all of these years. 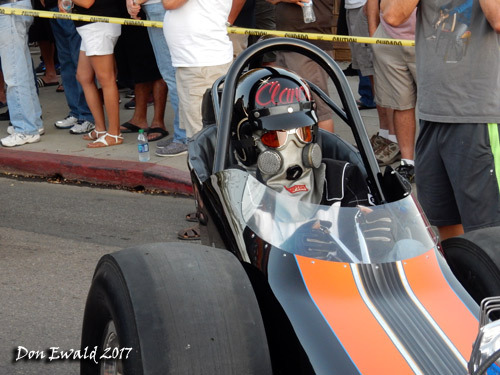 It was the heyday of push-started 200 mph nitro fueled dragsters at competing tracks with weekly 8 or 16 car elimination fields, national events with 32 cars and a few special events held with as many as 100 dragsters entered, qualifying for a 64 car field. 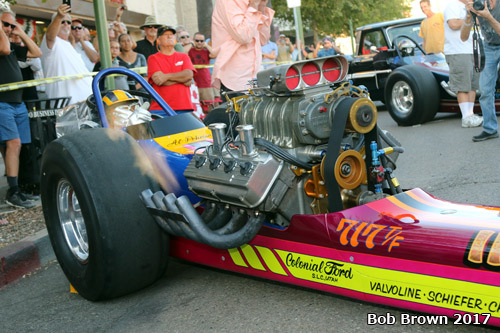 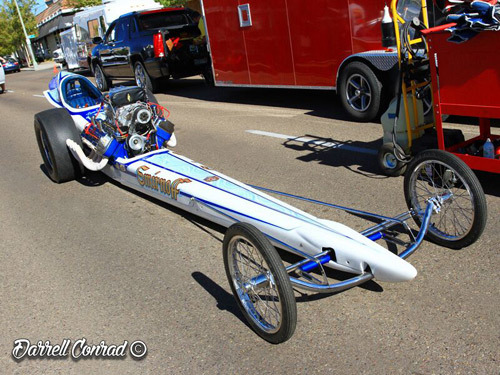 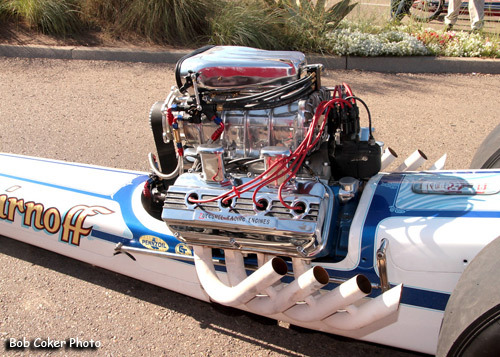 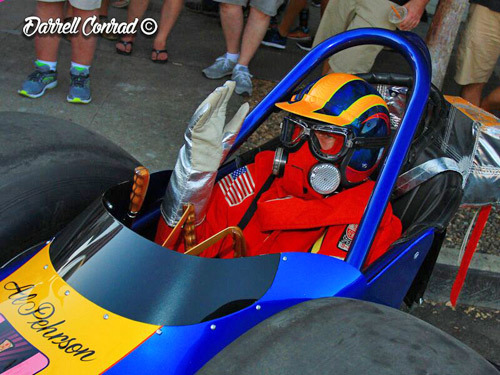 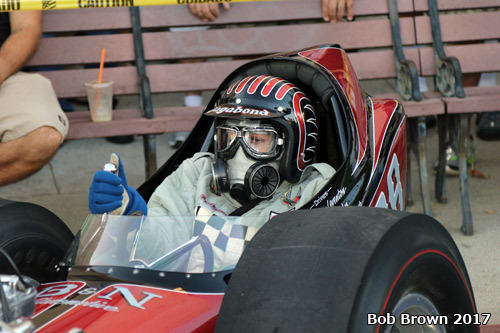 Increased speeds and technology obsoleted these front-engine nitro cars by early 1970s. 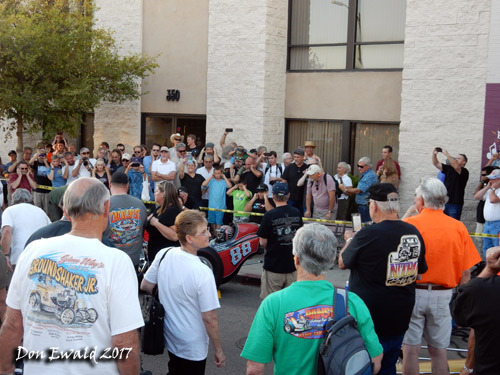 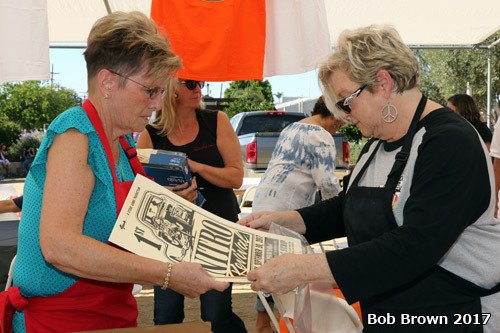 But the memories created among participants and fans alike endured. 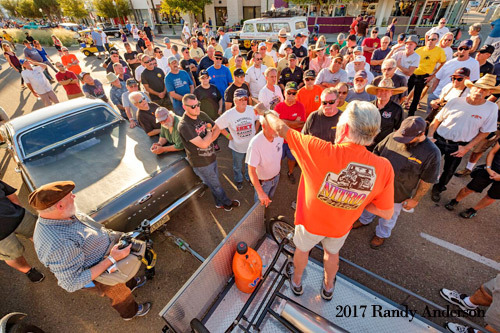 20 years ago, nostalgia played a role in bringing ssurvivor cars back to race tracks and car shows. 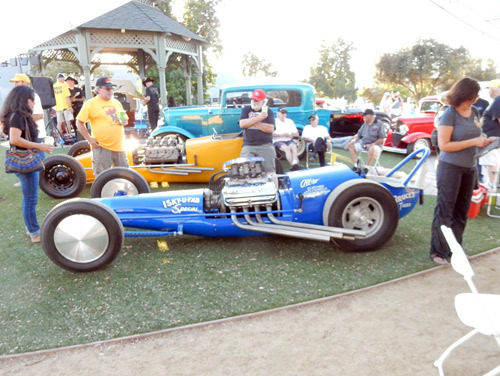 Today, most of these cars are faithful representations of actual cars from the 60s, either being restorations of original cars, or recreations of original cars which have disappeared or been destroyed. 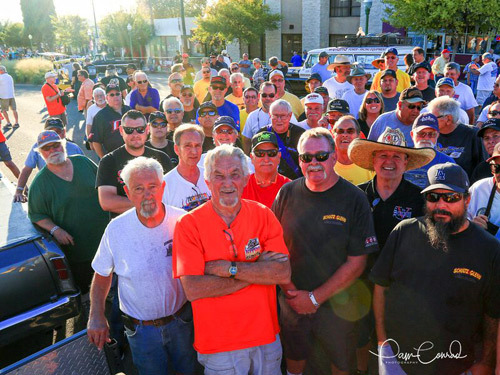 Some of the current owners and drivers of these cars were actually racing in the 50s and 60s and others just want to be a part of the representation of those historic days. 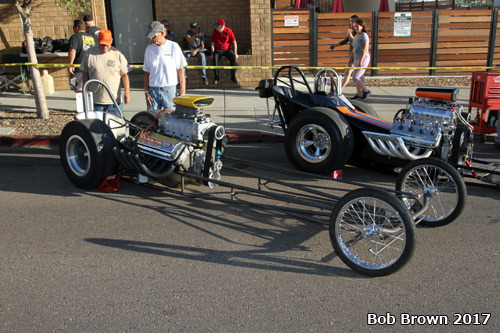 A few cars have been built simply as a tribute to the era but not representing an actual car from the 60s. 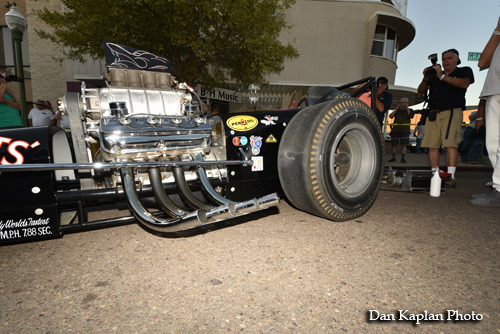 The cars pictured here were all part of Nitro Night. 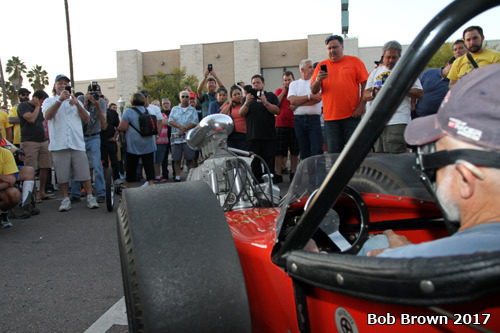 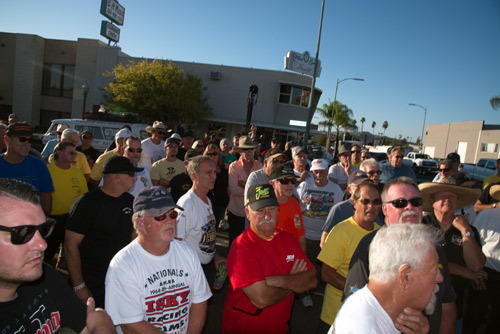 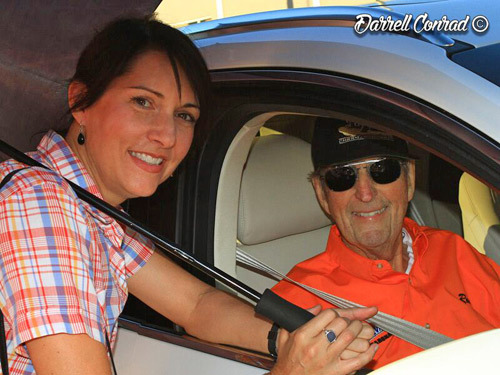 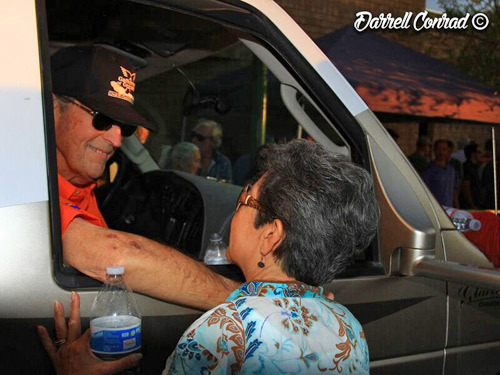 One more time, owners and drivers had the opportunity to show the fans what was a special time in their lives. 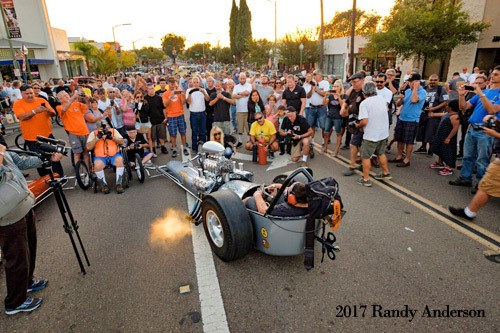 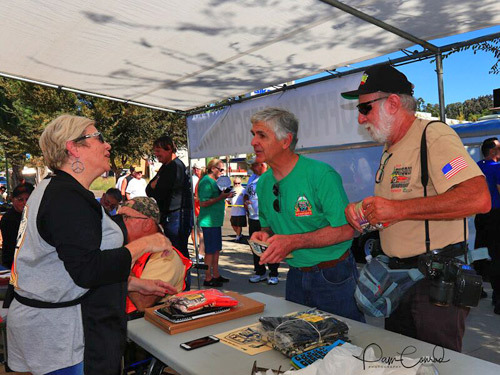 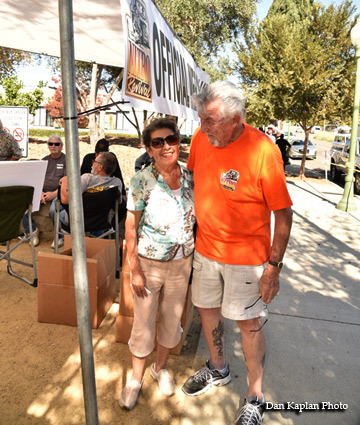 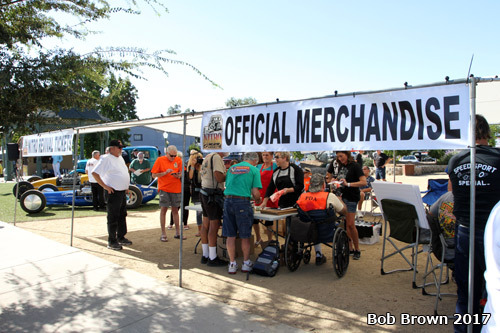 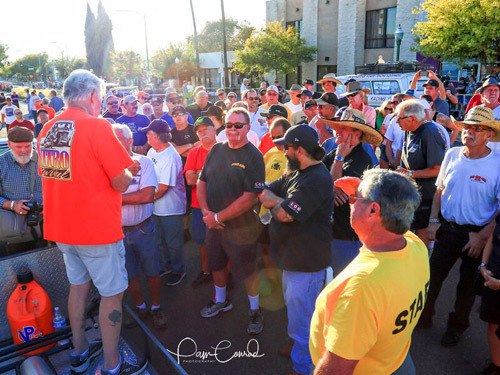 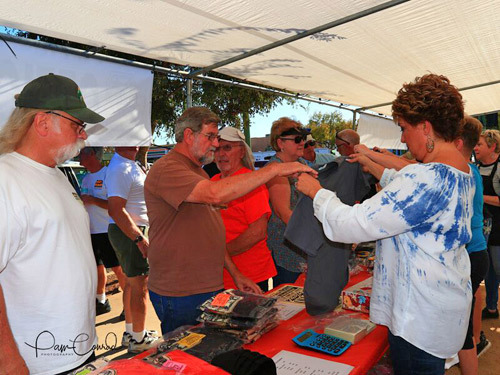 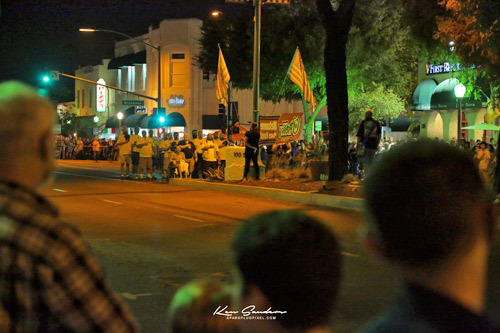 Grand Avenue in Escondido became the stage once again for the rolling thunder of one of the most spectacular, awesome, city street events anywhere. 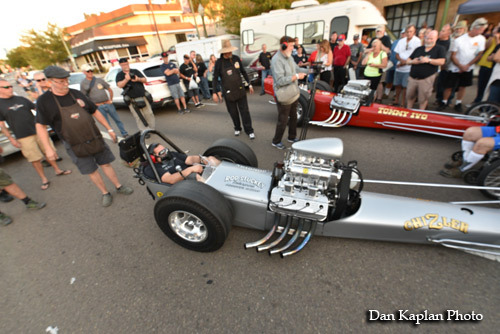 This year the push down Grand was extended another block giving many more fans a close up view. 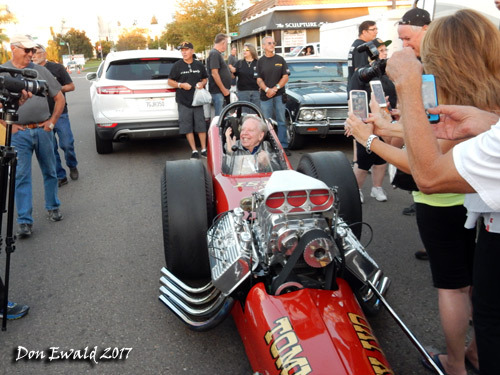 The huge bonus was that these cars and many others were at Brona Dragway the following day for the Inngural Nitro Revival which will be ready for viewing very soon. 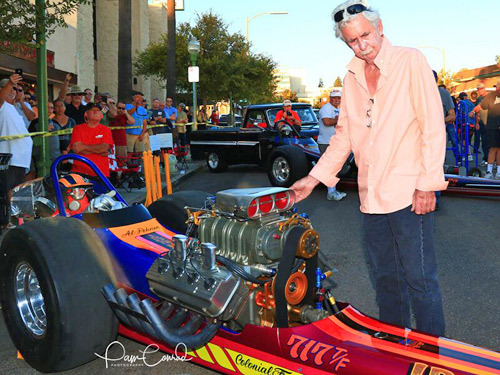 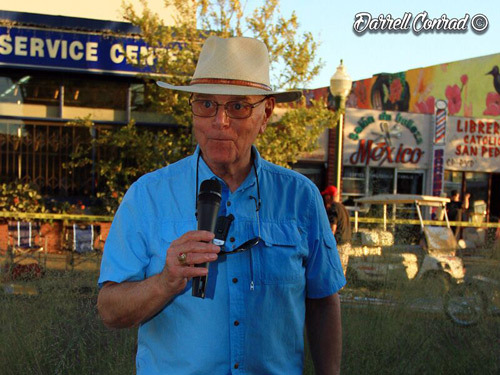 Ron Johnson passed away on Wednesday, October 10, 2017. 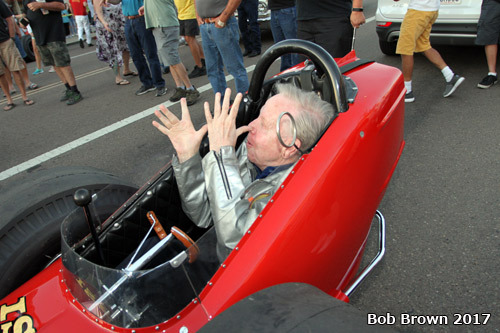 He was 83 years old. 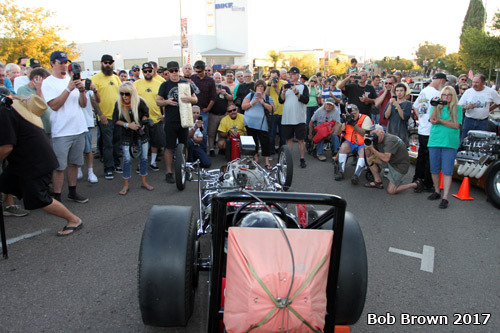 Its hard to comprehend how fast this has all happened. 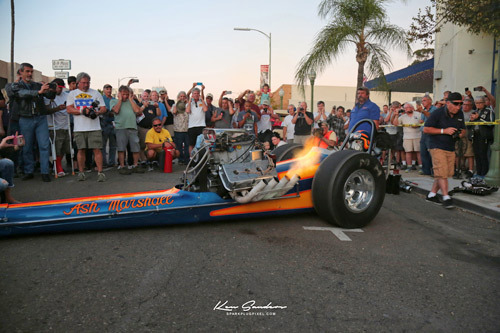 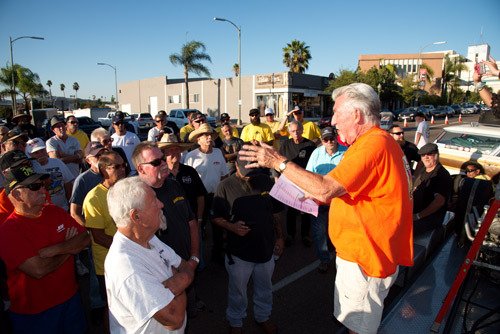 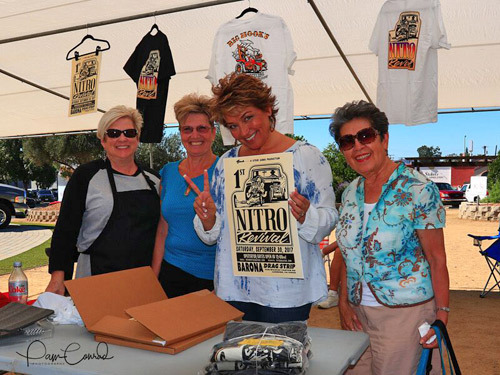 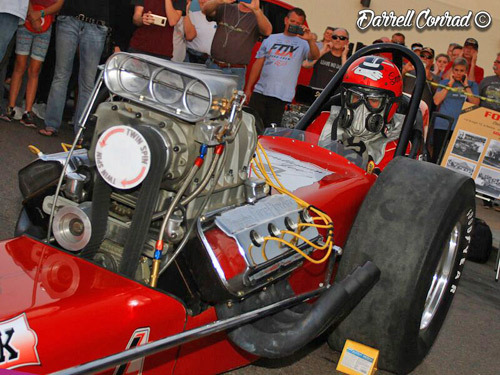 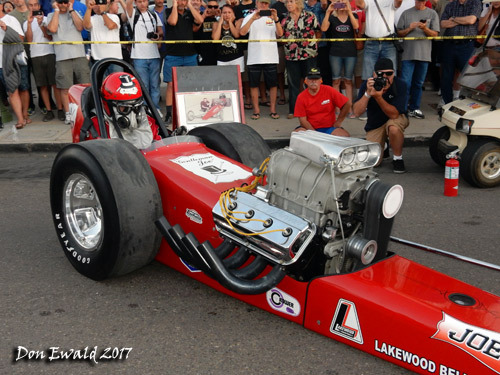 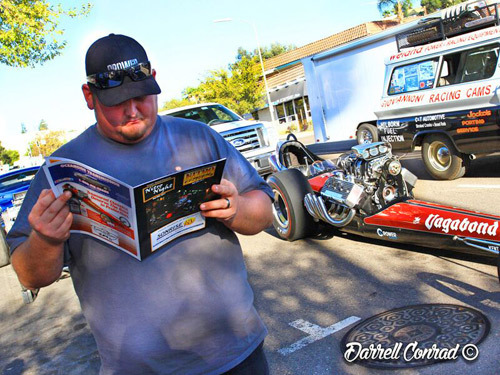 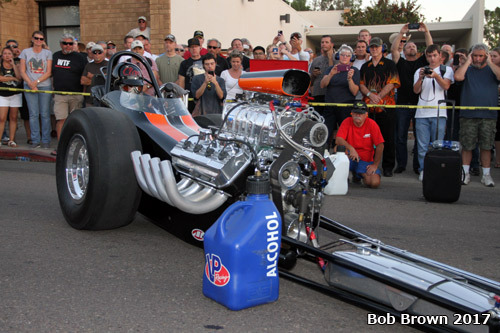 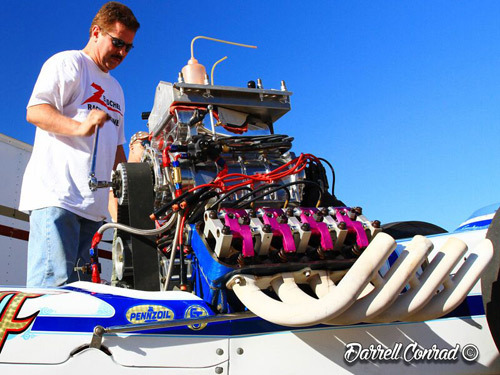 Until about six weeks before the events, Ron was going strong working hard on Nitro Night in Escondido, and the inaugural Nitro Revival at Barona. 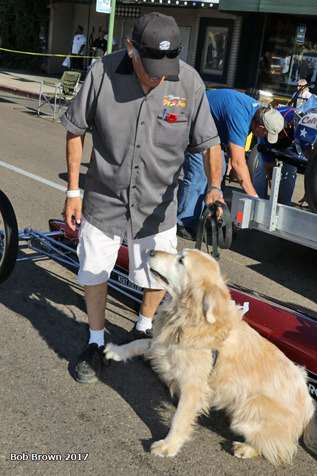 He began to complain about some "muscle aches"
or possibly a broken rib before deciding to consult with doctors. 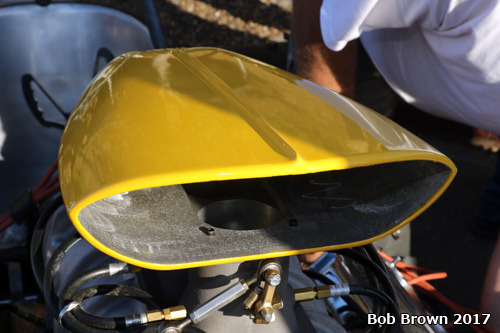 A scan revealed the devastating news of advanced cancer. 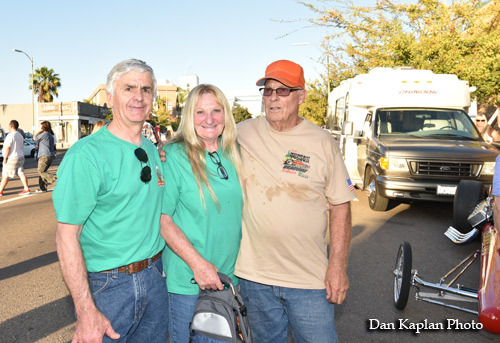 Ron went through bladder cancer some 15 years ago, so it could have been a related development. 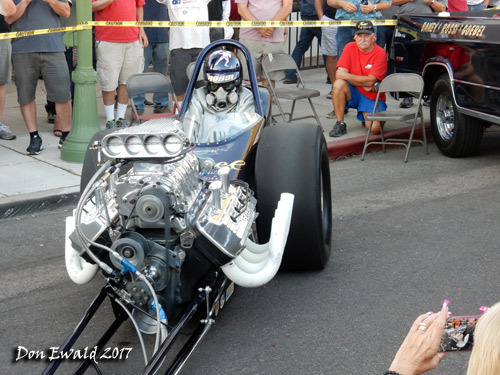 It was such a blessing that he was able to get to the Escondido and Barona events and enjoy them. 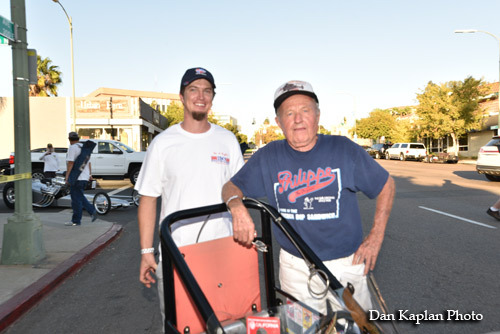 He was extremely pleased. 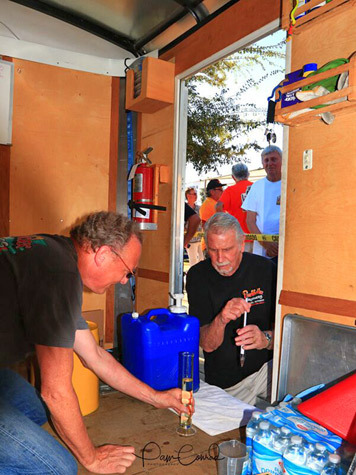 Steve Gibbs visited him the previous Friday, and found him in bed wearing his orange Nitro Revival staff uniform shirt. 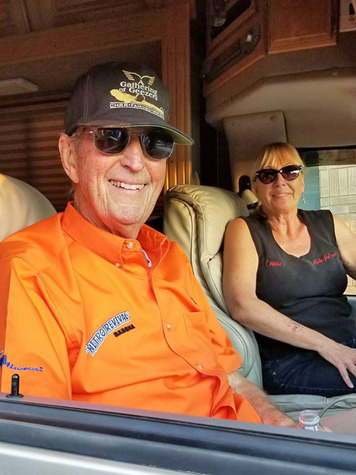 Ron faced his situation head-on, and should be an inspiration to us all. 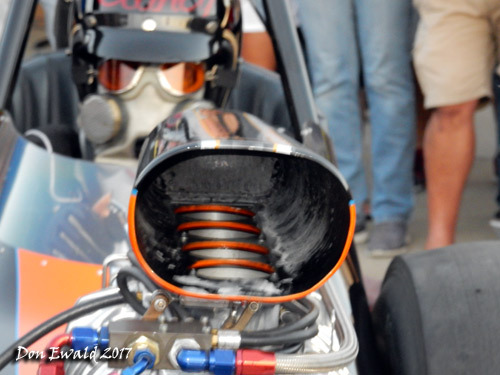 His family did all they could to make him comfortable to the end. 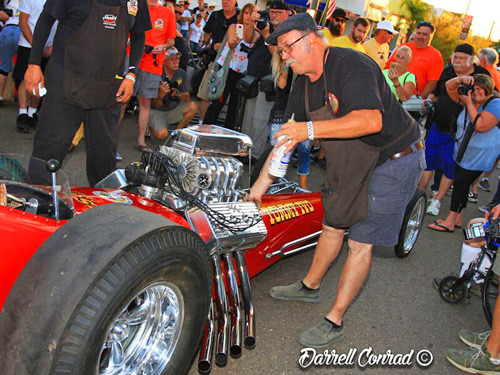 Not enough can be said about Rons contributions to the "Cacklecar" movement. 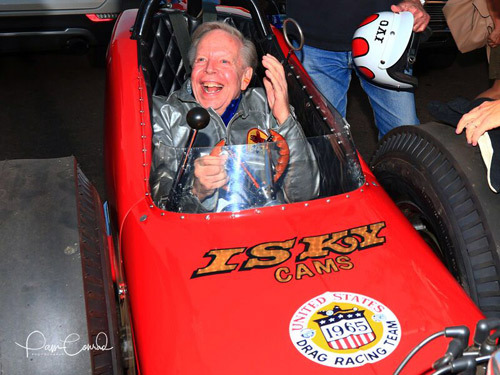 We are all having a hard time imagining things without him. 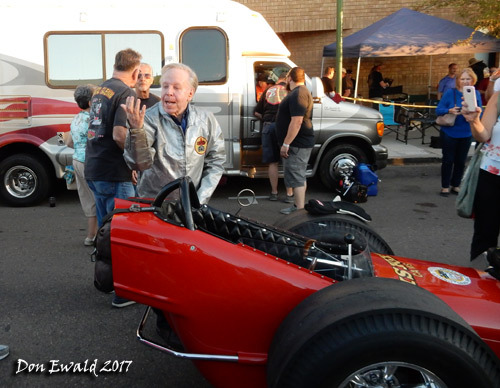 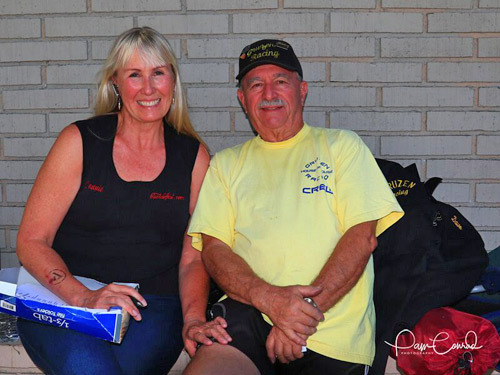 However, his legacy is long and deep, his kids Kol, Connie and crew will continue to share his three cacklecars; The Chris Karamesine "Chizler" AA/FD, Tommy Ivo "Barnstormer" AA/FD and the Shubert & Herbert A/FD. 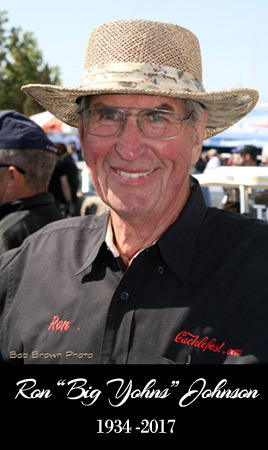 That said, we will carry on as Ron wished, celebrating his life and the events that were so much a part of his final 8 months of time on earth. 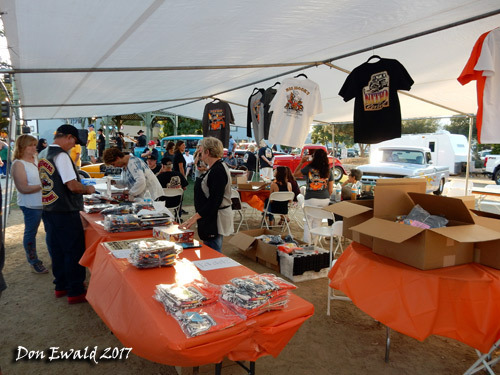 The first thing we saw was the Official Merchandis of Nitro Revival gear including logo T's, event T's, NR hats, posters and other goodies. 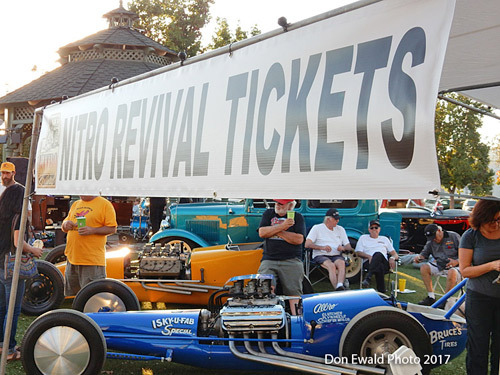 There were also Nitro Revival tickets on sale. 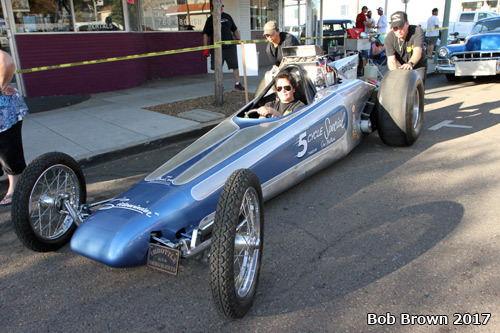 Stephanie Gibbs Kinder. 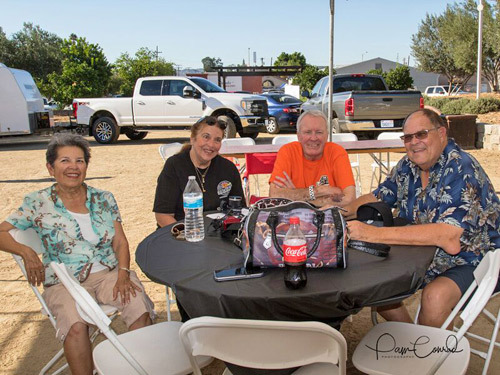 Mom Gloria (Gordy) on the right. 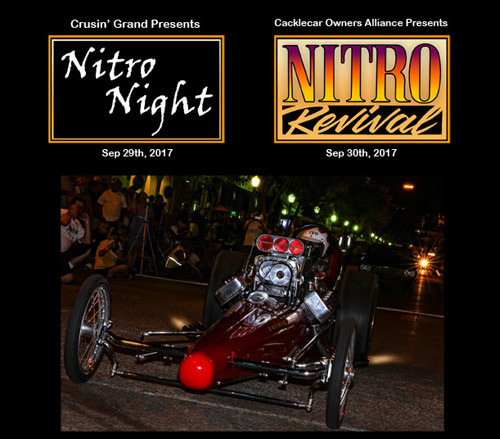 Ross Preen whips out the ol CC to stock up on Nitro Revival goodies to take back to Austraiala when he and wife Jude end their event tour. 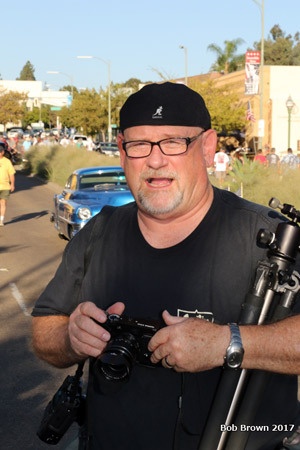 Photog Dave Kommel is next. 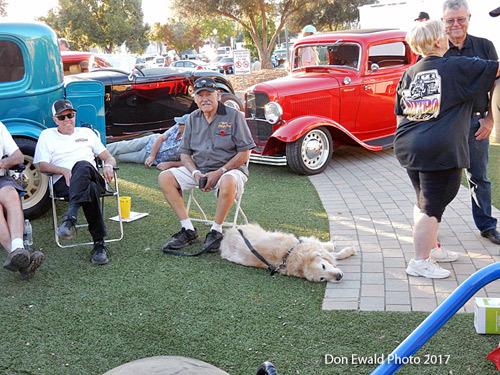 Kickin back early on, Jimmy Scott, Geno & Harley with Ed McCulloch to the right. 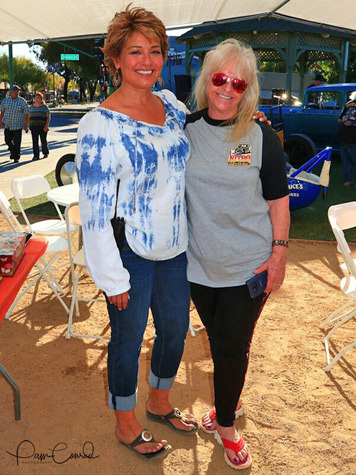 Cindy Gibbs and Maureen Fairbairn who traveled all the way from New Zealand to be here. 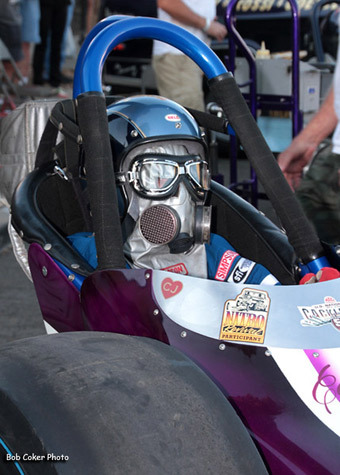 She is a well known Kiwi drag racer...for years she was considered the fastest woman in their country. 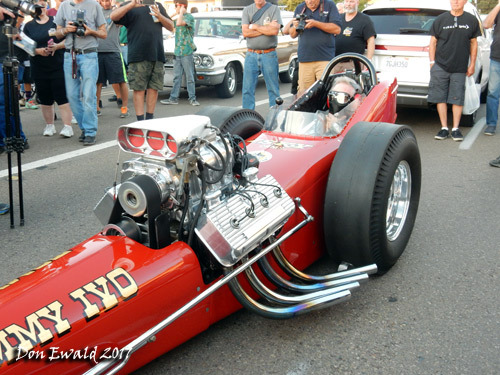 "Devil Woman" was the name of the car. 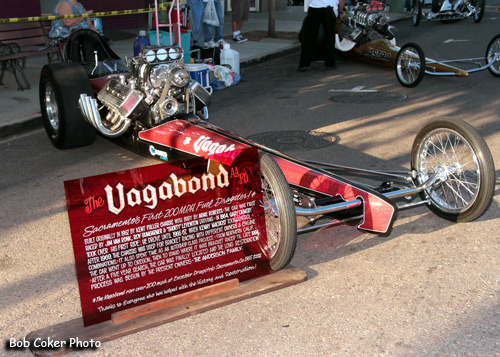 Old school trailers for both the Anderson Family "Vagabond" and the "Magicar" of Bill Pitts. 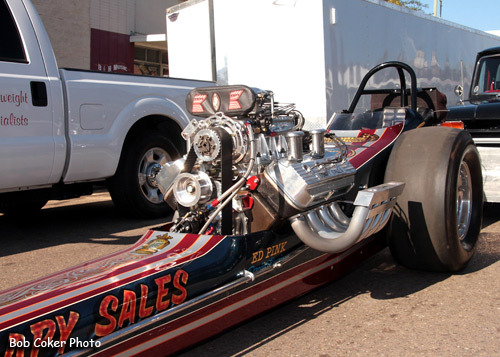 Tommy Allen getting his Soapy Sales AA/FD unloaded and to his spot. 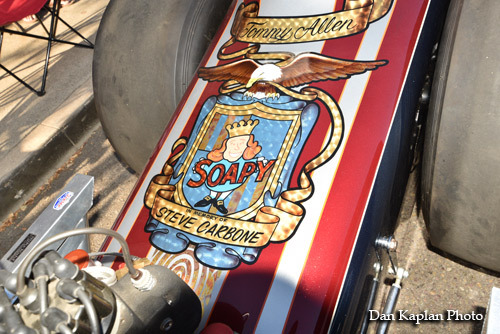 Tommy Allen's "Soapy Sales" AAFD after the unload. 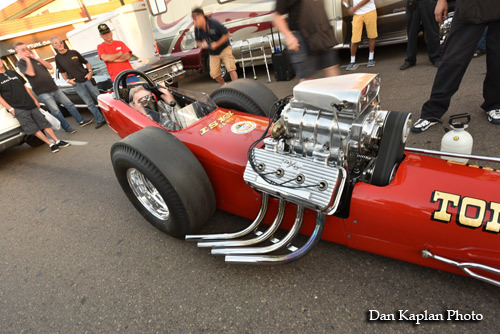 The Mike Kuhl AA/FD out of the trailer. 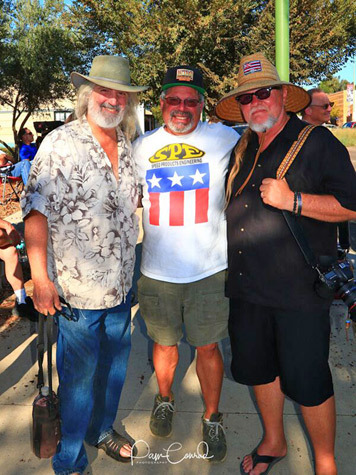 Kenton and Red Greth with Joe Schubeck. 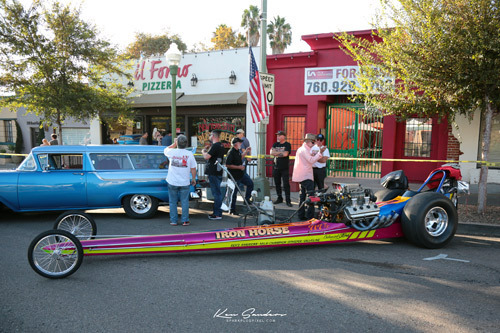 Sam Chastain getting his Iron Horse in its parking place. 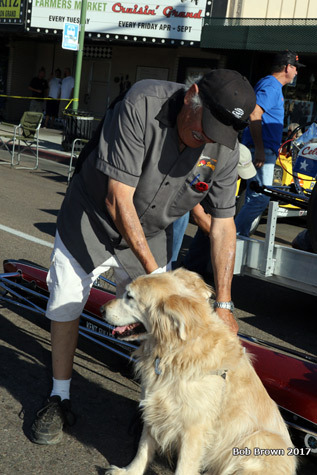 Geno and Harley were on hand, all was good. 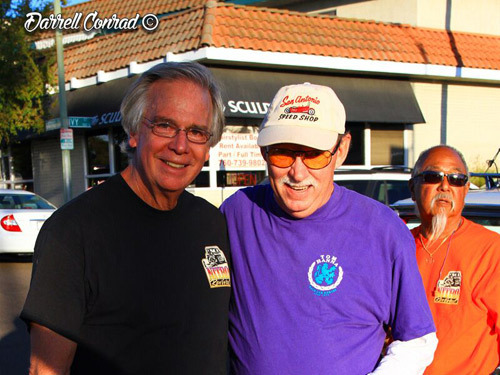 Gordy, Maxine "Max" Zewiey, Don Ewald and Jeff Crowther. 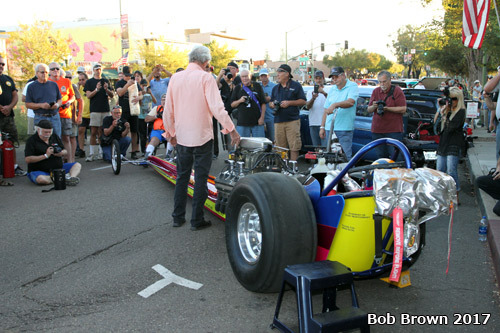 The cars were all parked on the blocked to traffic Grand Ave. so the fans could see them up close and personal. 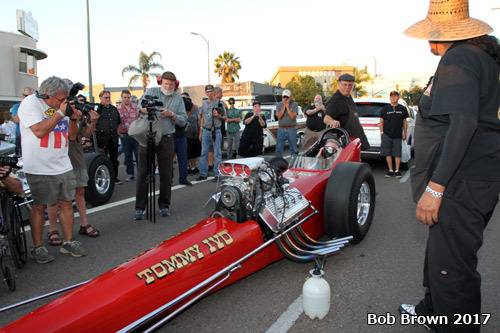 Ron Johnson's Tommy Ivo "Barnstormer" and Chris Karamesines "ChiZler" waiting for their parking spots. 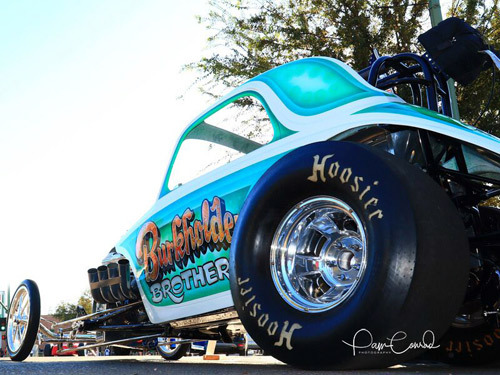 Burkholder Bros. AA/FA which is always a fan favorite. 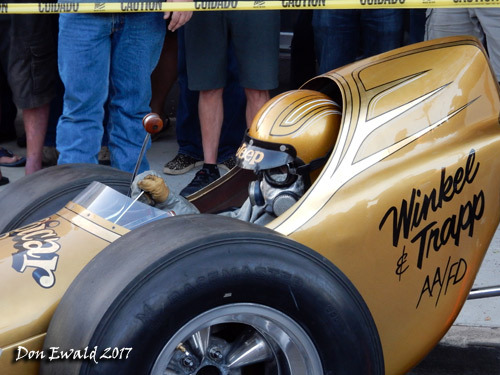 Jack Gillett's Sidwinder A/D with its super cool new paint job made its debut. 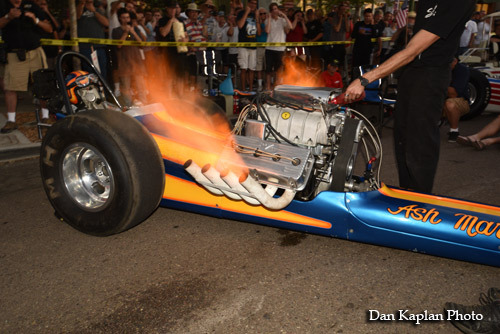 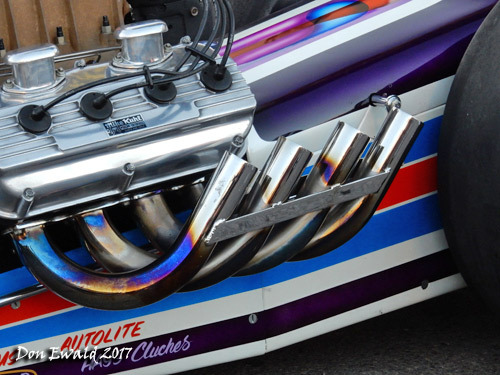 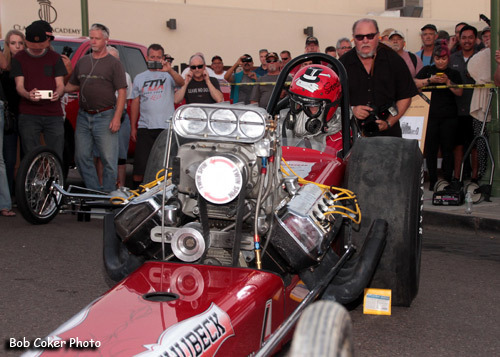 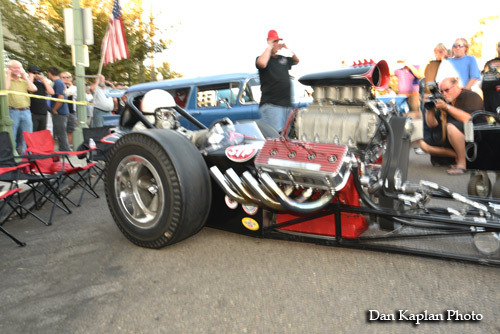 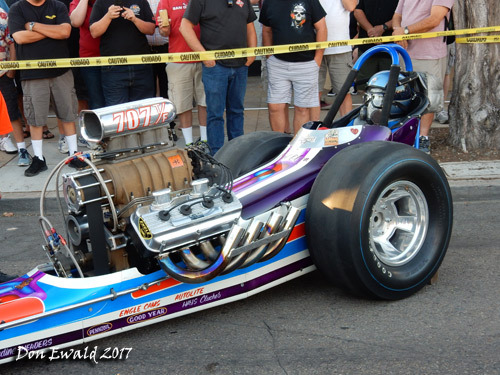 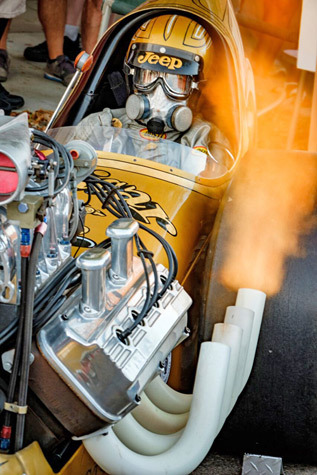 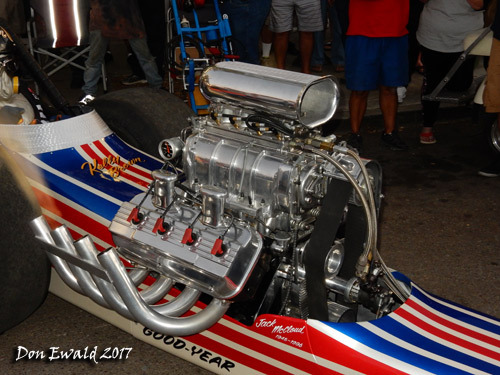 National Dragster photog Randy Anderson attended his first Nitro Night and stayed to shoot the Nitro Revival on Saturday. 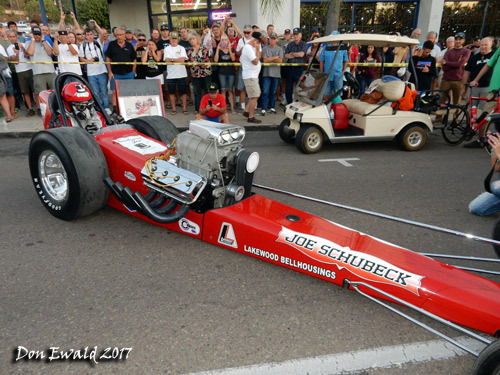 Although Bob Higgenson was unable to meet his target date with the spot on recreation of the Skinner, Jobe & Crosser AA/FD it gave a great taste as to the finished product. 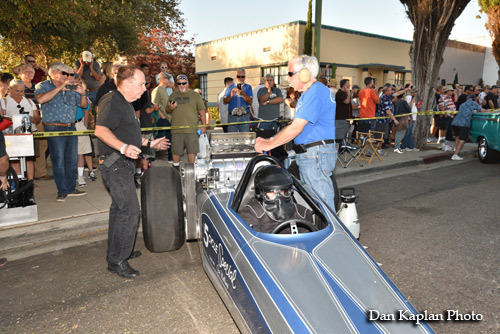 Bill Pitts with John Barrett who was the owner of the Magicar before Bill. 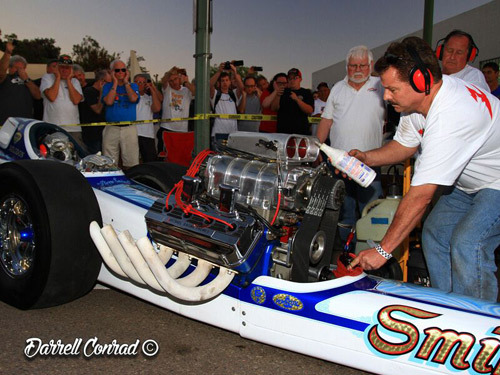 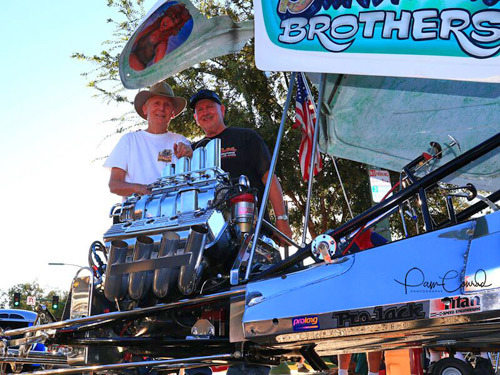 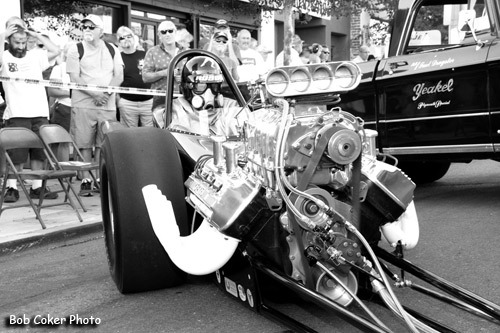 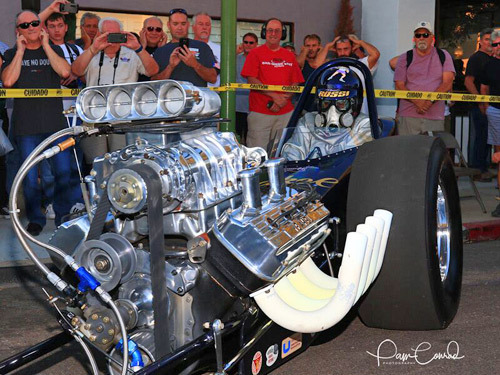 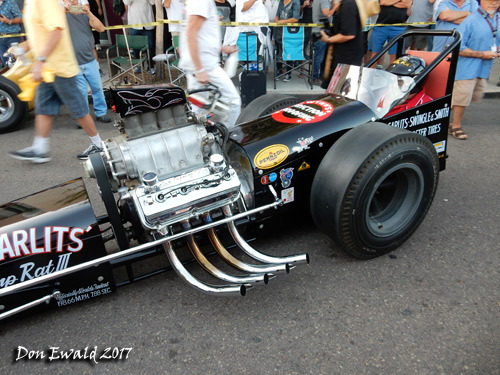 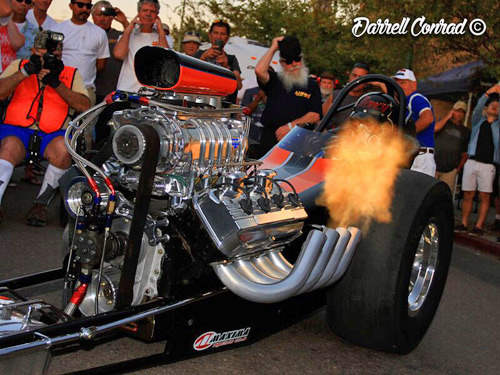 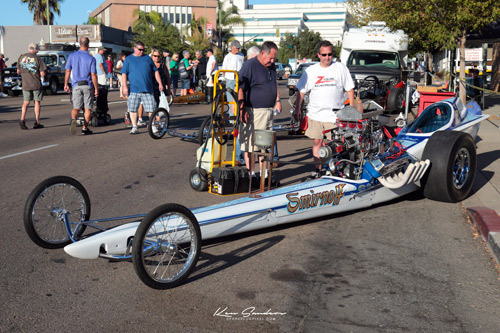 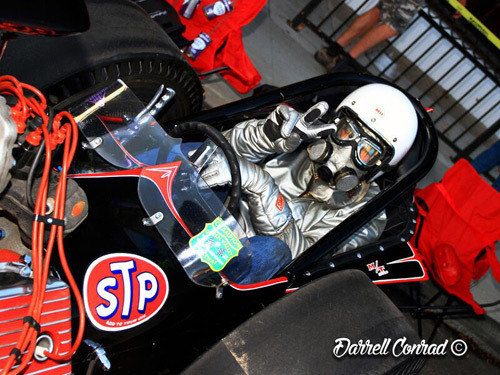 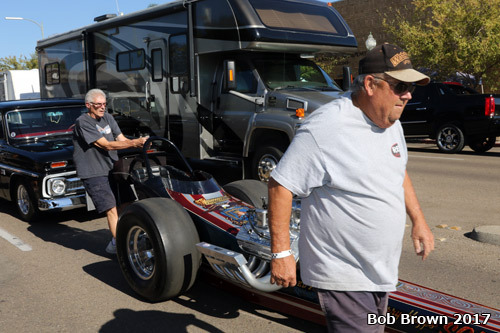 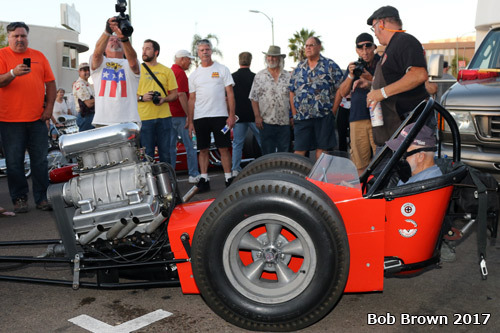 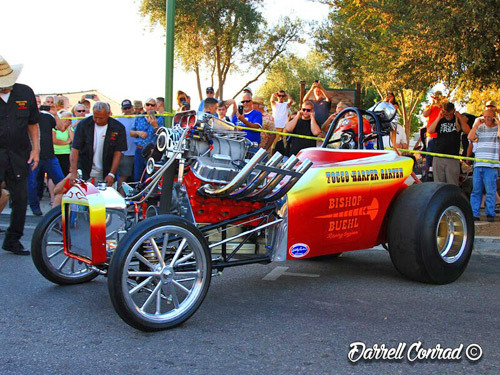 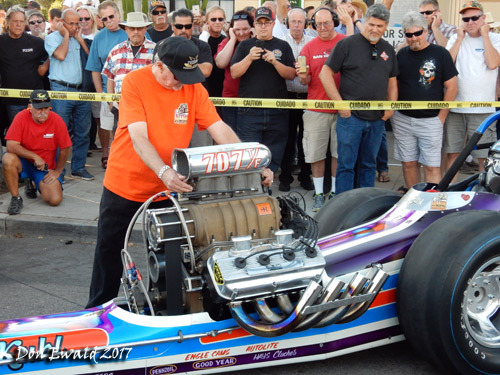 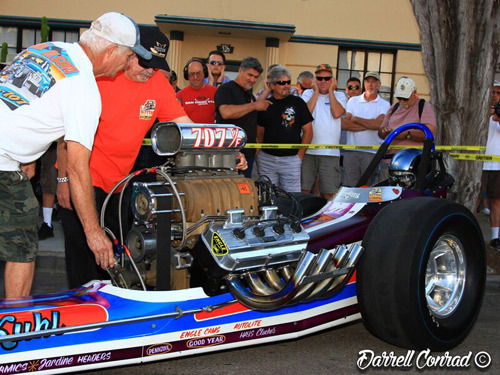 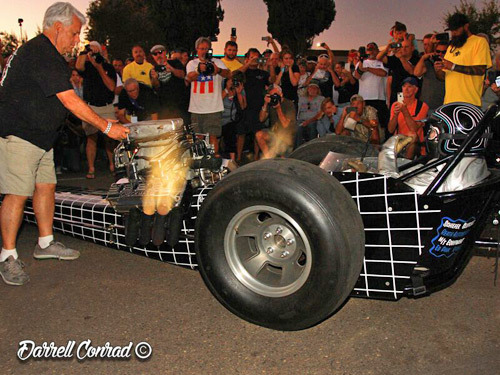 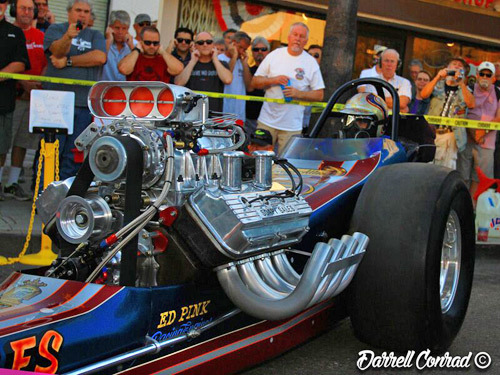 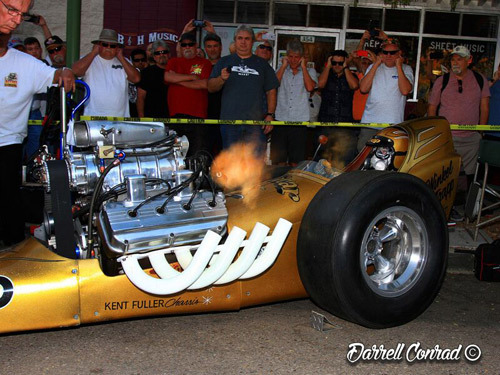 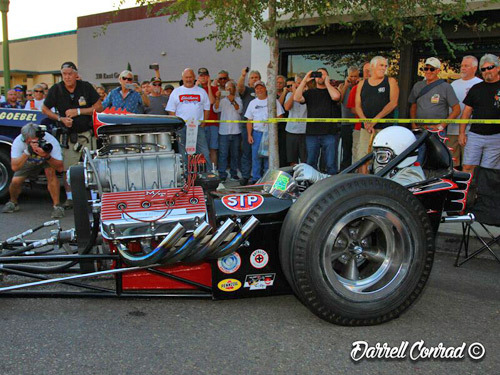 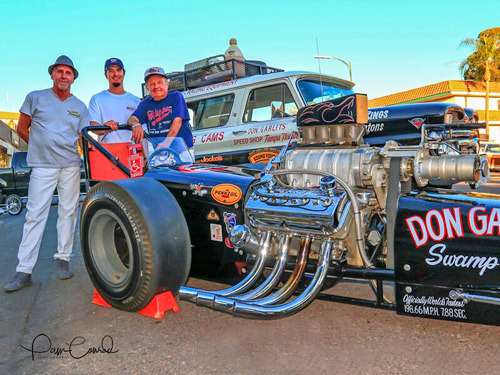 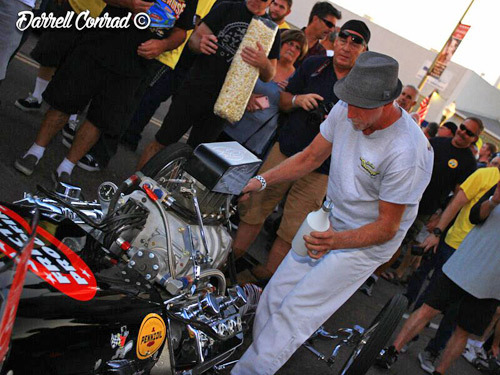 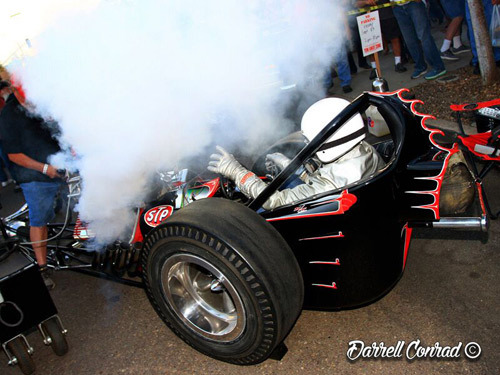 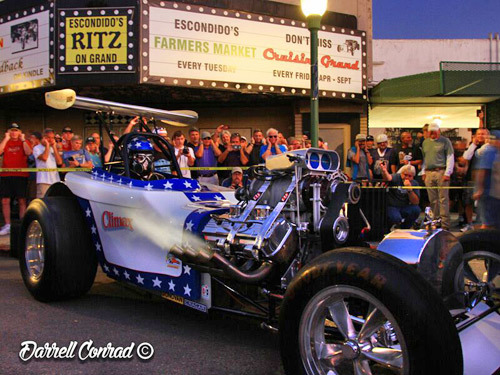 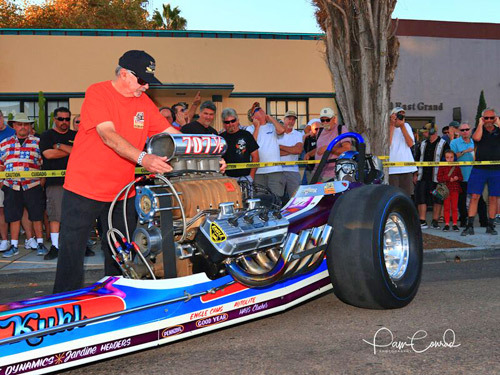 Showman Sonny Messner with his Don Garlits Swamp Rat III AA/FD. 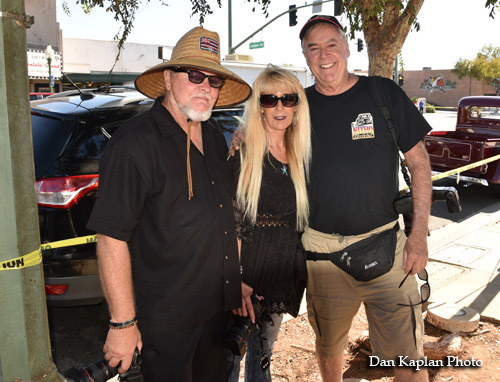 All the way from Australia, Ross and Jude Preen with Jay Carpenter. 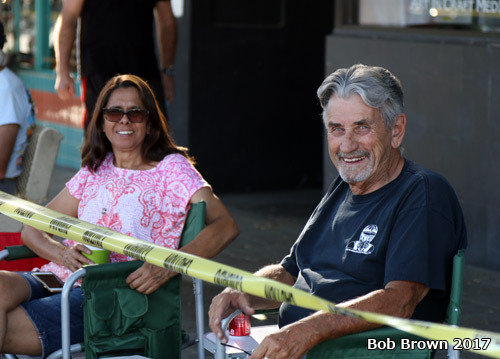 Maria and Walt Steven nailed down premier viewing spots early on. 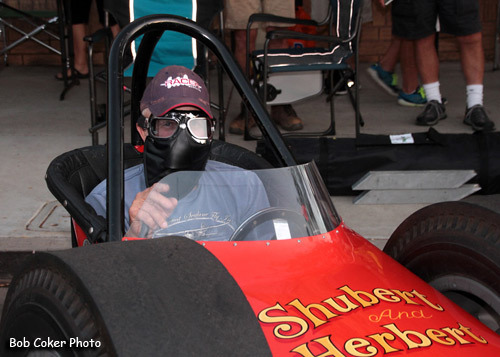 Cat hurder Steve Gibbs once again laid down what was suppose to happen. 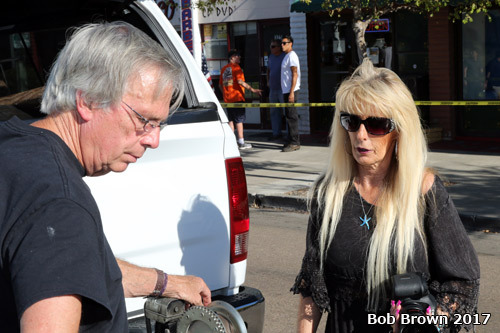 Key word was suppose. 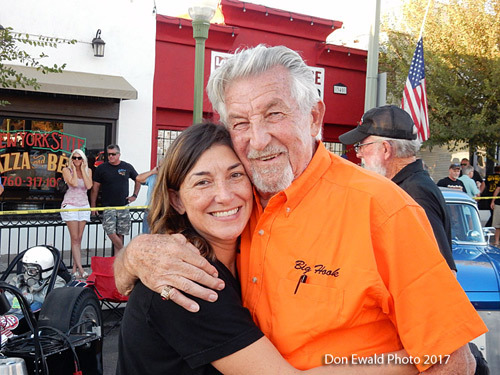 Stephanie Gibbs Kinder, Steve and Gordy's youngest daugher. 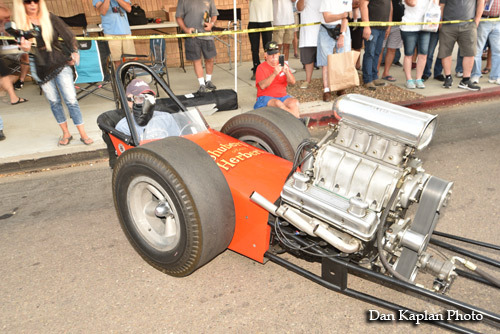 "Thunderlungs" Jon Lundberg made his swan song appearances announcing at Escondido and the next day, at Barona. 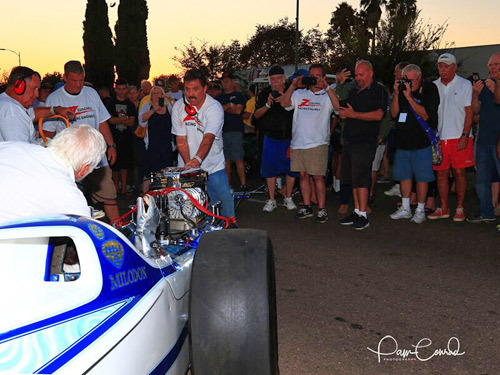 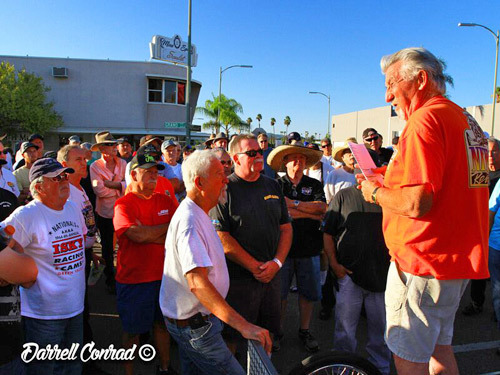 We were proud he chose these events to end his 60 year career as one of racings premire annoucers. 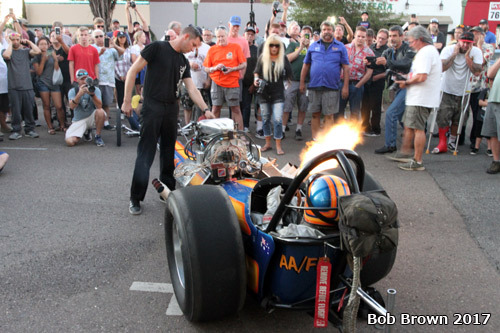 At about 5:30 the street static fire-ups were led off by the Burkhoder Bros. 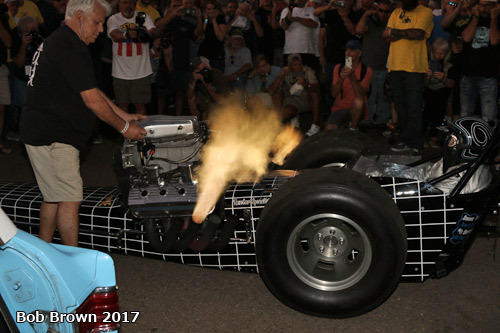 The cars were fired one after another down one side of the street and up the other. 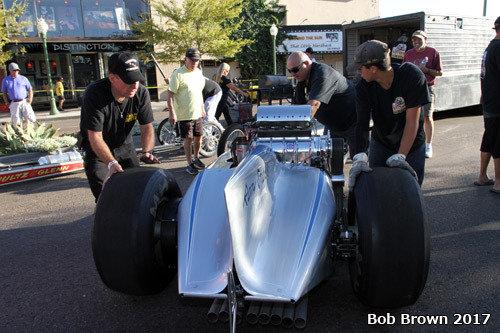 Tocco, Harper & Garten AA/FA with Mike Tocco at the controls. 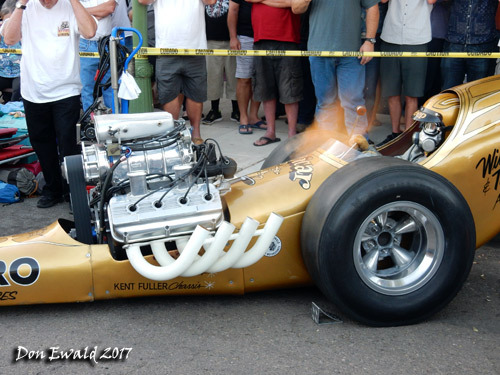 Carl Olson working the injetors of the Kuhl & Olson AA/FD. 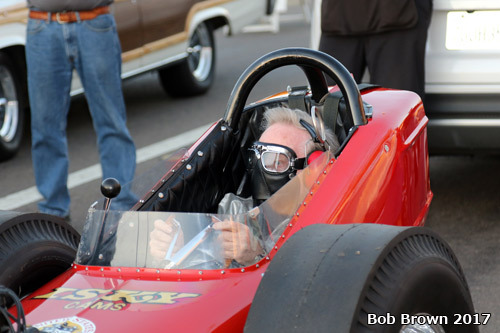 Mike was a bit under the weather but was in attendence. 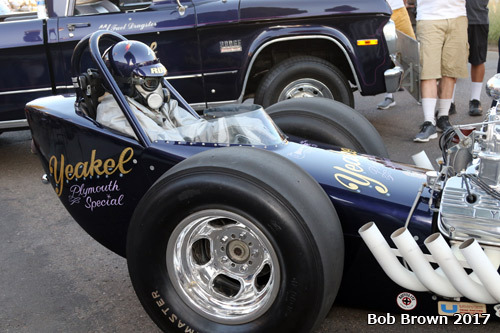 The Rossi, Baney & Goebel Yeakel Plymoth Spec. 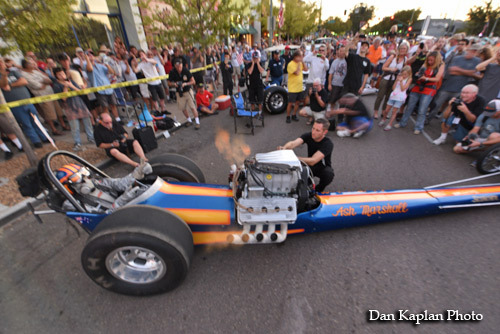 AA/FD with Paul Rossi in the seat. 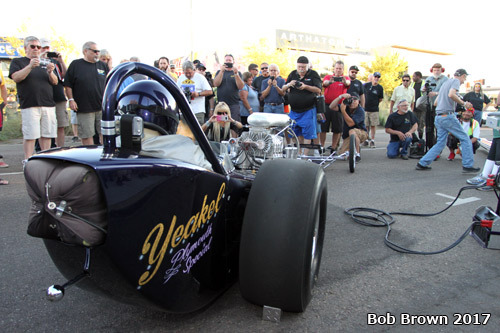 Bobby Langley's Scorpion V with Blake Crosby in the seat. 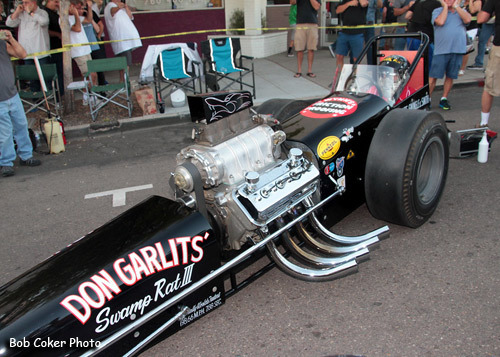 Don Garlits Swamp Rat III AA/FD with Sonny Messner in the seat. 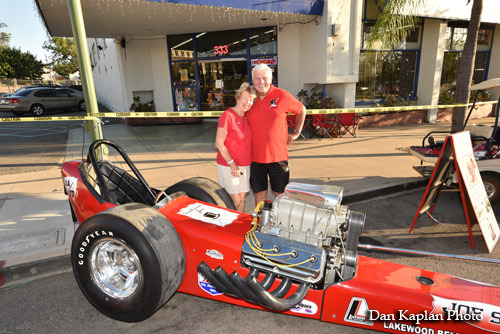 Ron Johnson along with daughter Connie were on hand to see all thee of his cars fire-up on Grand. 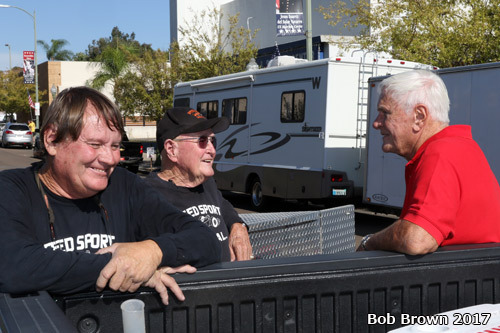 Nostalgia Top Fuel 2017 championship contender, Mendy Fry and Gordy Gibbs were among many who stopped by to wish Ron well. 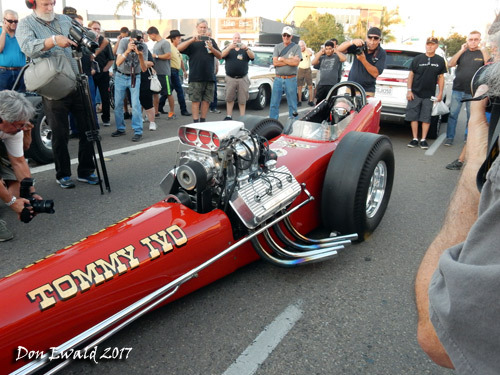 "TV Tommy" Ivo his ownself. 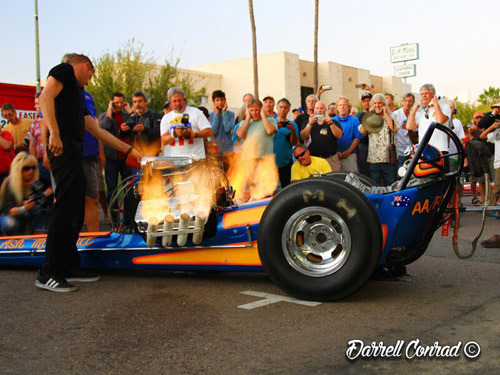 Mark McCormick in Ron Johnson's "ChiZler" AA/FD. 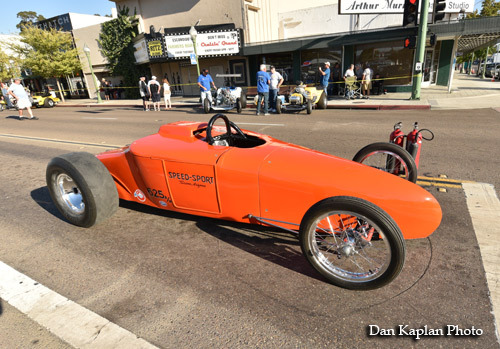 The magnificant Smirnoff AA/FD restored and owned by Joe Passelaqua. 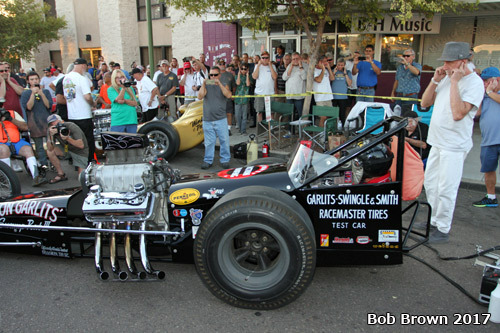 "Gentelman Joe" Schubeck in his 1966 Garlits car. 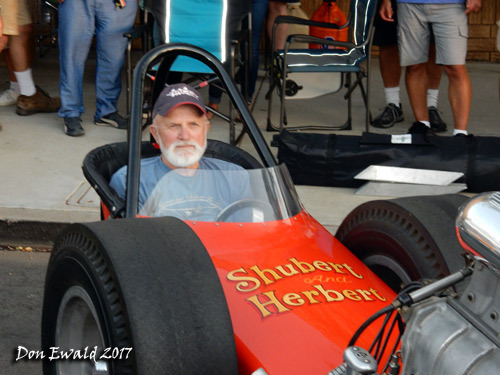 Zane Shubert in the Herbert & Shubert SBC A/FD owned by Ron Johnson. 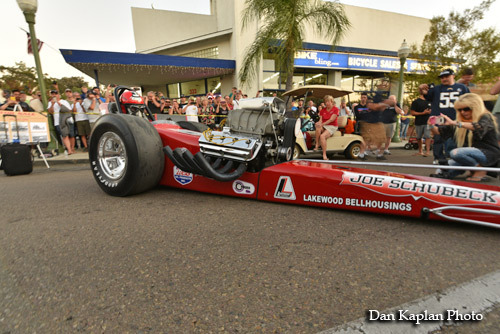 Jay Carpenter's Southwind AA/FD with Mike Clancy in the seat. 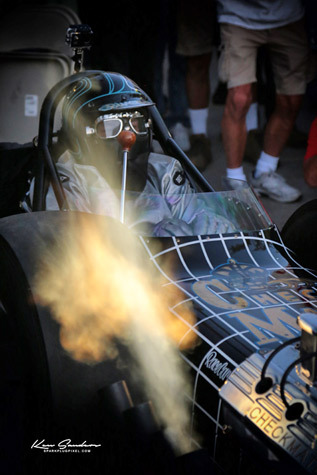 The Dean Eng. 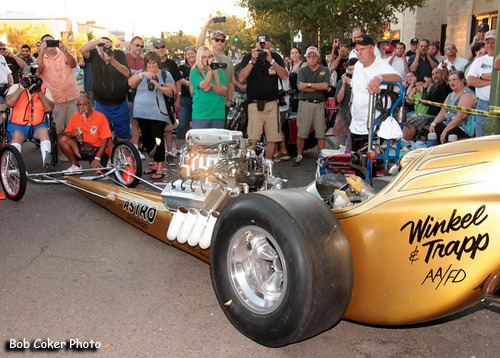 Special AA/FD of Jake McCloud debuted its new paint job and it is killer! 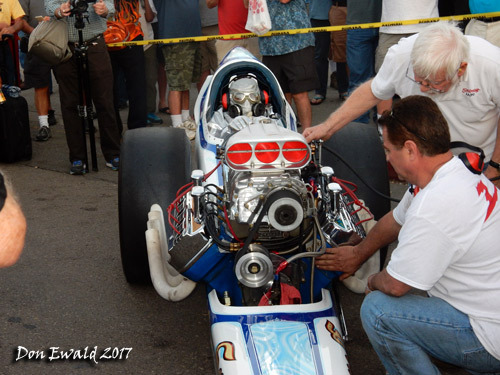 Jerry Bivens works the butterflys on his Check Mate AA/FD. 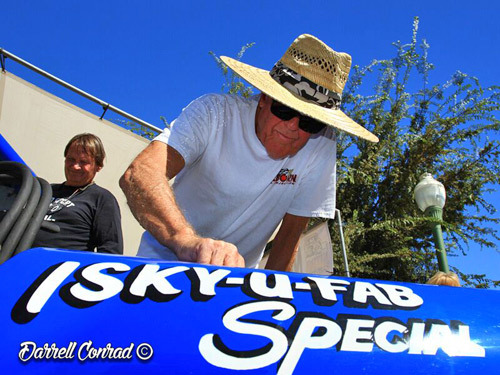 Parriach Joel Gruzenburg oversees son David in the Newhouse Spec. 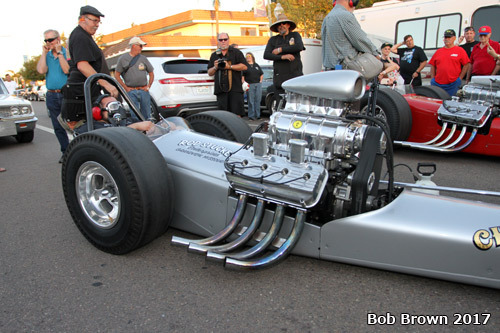 AA/FMR. 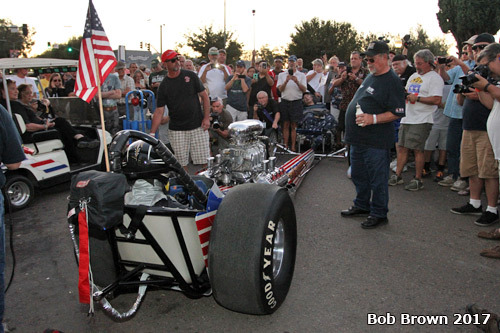 Prior to the main event the National Anthem was played and no body took a knee.